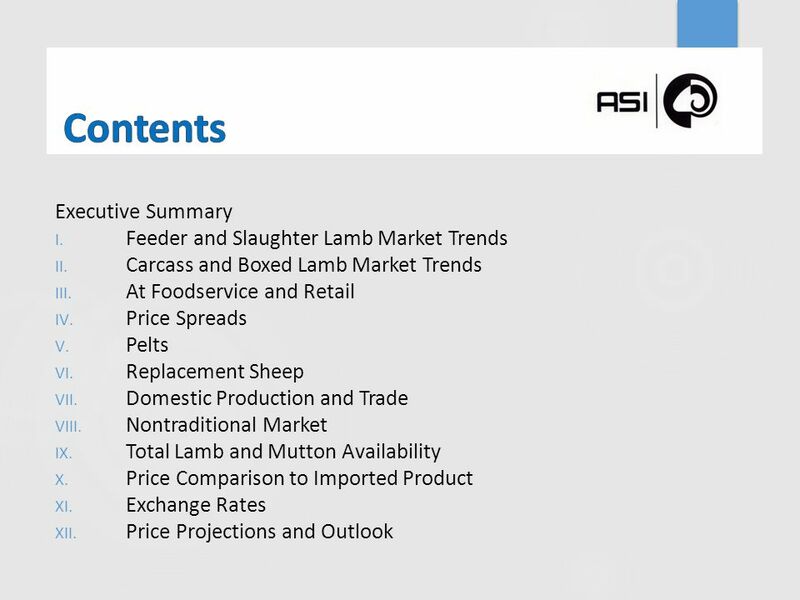 First-Quarter 2014 Sheep Industry Review Prepared by the American Sheep Industry Association for the American Lamb Board April 2014. 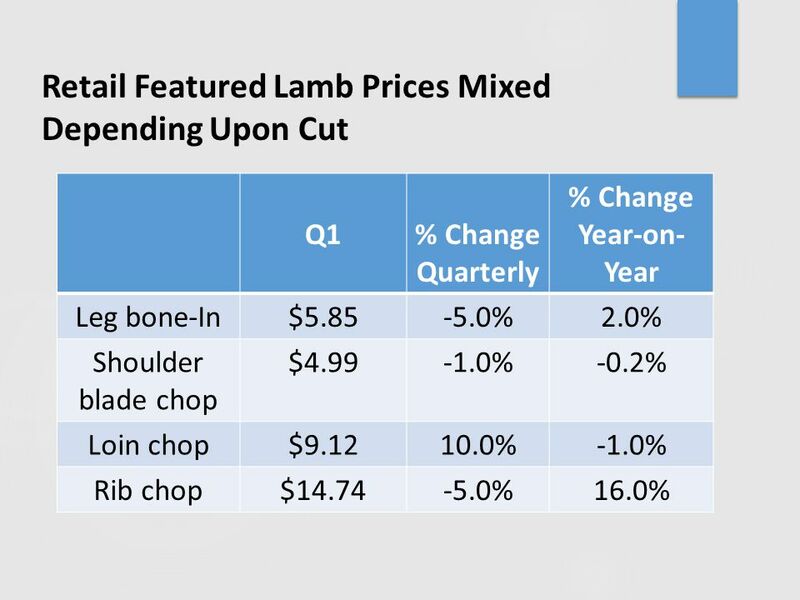 3 Executive Summary Lamb markets rebounded strongly from last summer, but during the first quarter of 2014 price gains lost momentum in the feeder, slaughter and wholesale markets. Many markets saw prices weaken between February and March, an unseasonable surprise. 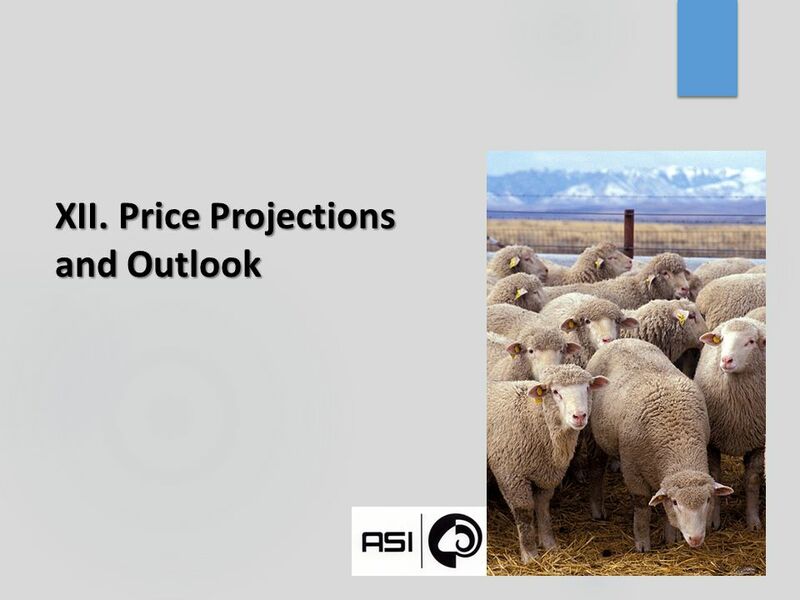 By comparison, retail prices in features held relatively steady over the past year with minimal gains and beef prices continued to charge upward. 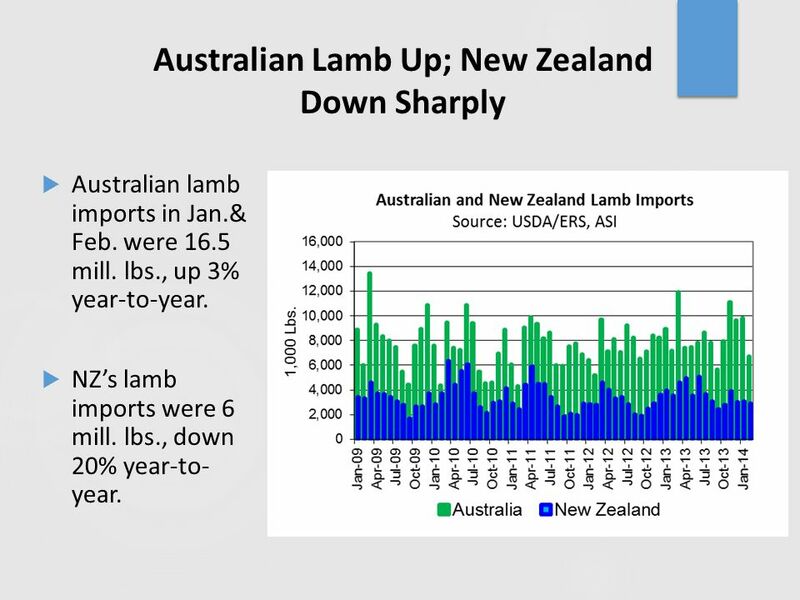 The slowdown is a puzzle and explained perhaps by wavering consumer confidence in lamb quality and international pressures. 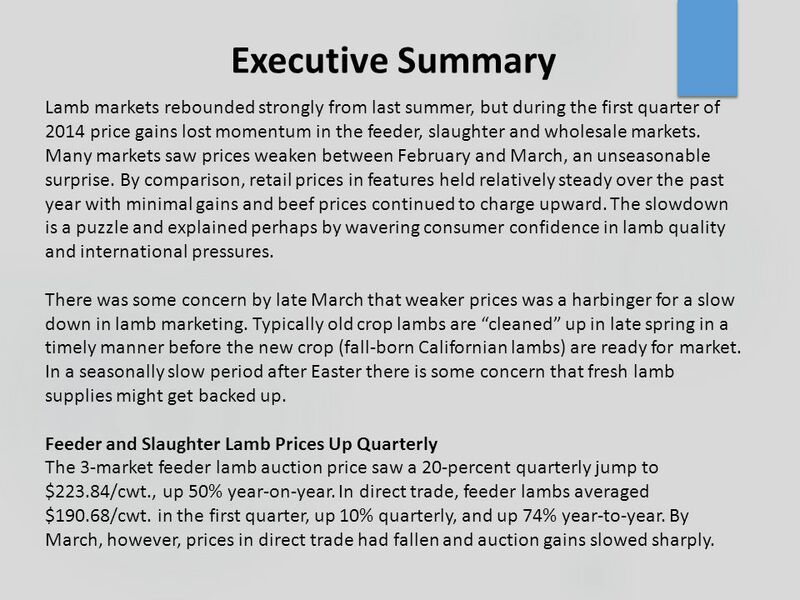 There was some concern by late March that weaker prices was a harbinger for a slow down in lamb marketing. Typically old crop lambs are “cleaned” up in late spring in a timely manner before the new crop (fall-born Californian lambs) are ready for market. In a seasonally slow period after Easter there is some concern that fresh lamb supplies might get backed up. 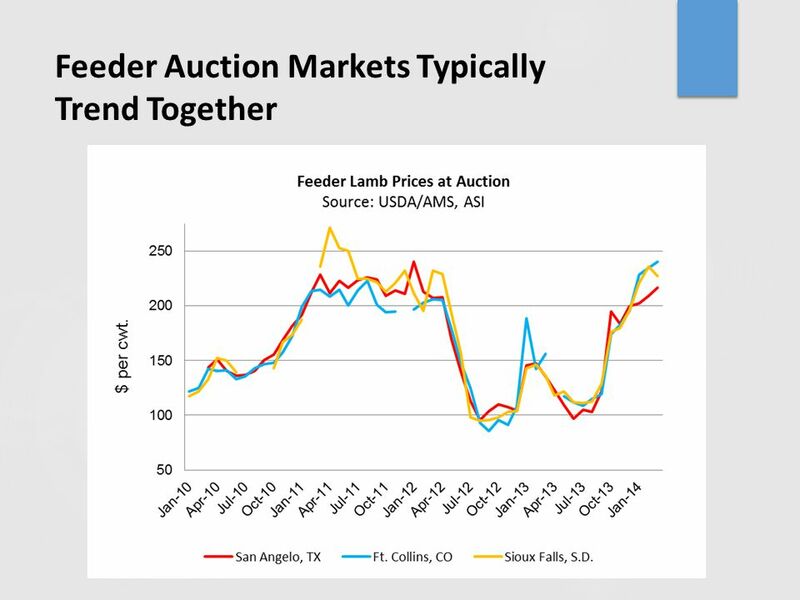 Feeder and Slaughter Lamb Prices Up Quarterly The 3-market feeder lamb auction price saw a 20-percent quarterly jump to $223.84/cwt., up 50% year-on-year. 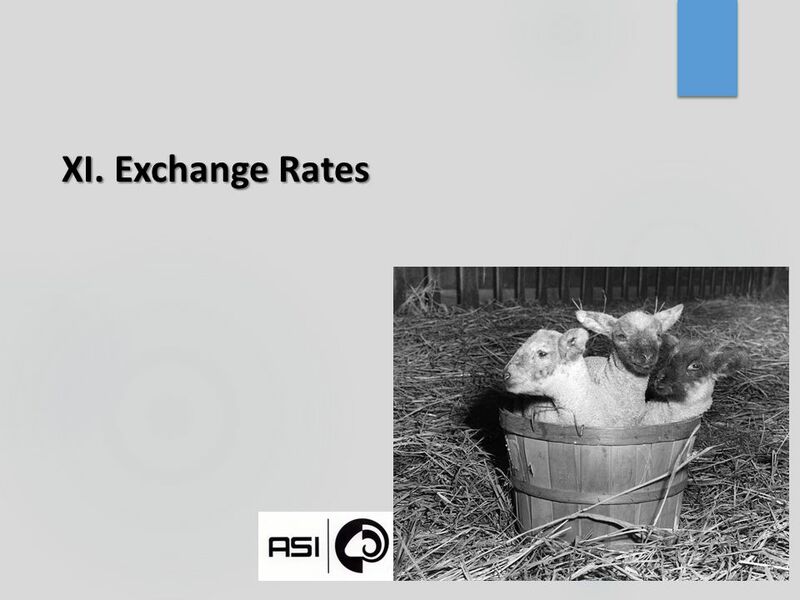 In direct trade, feeder lambs averaged $190.68/cwt. in the first quarter, up 10% quarterly, and up 74% year-to-year. By March, however, prices in direct trade had fallen and auction gains slowed sharply. 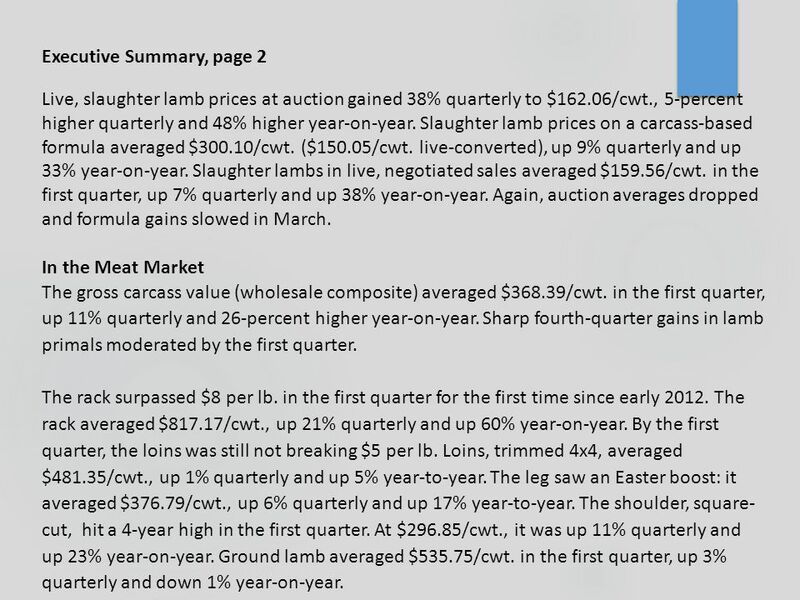 4 Executive Summary, page 2 Live, slaughter lamb prices at auction gained 38% quarterly to $162.06/cwt., 5-percent higher quarterly and 48% higher year-on-year. 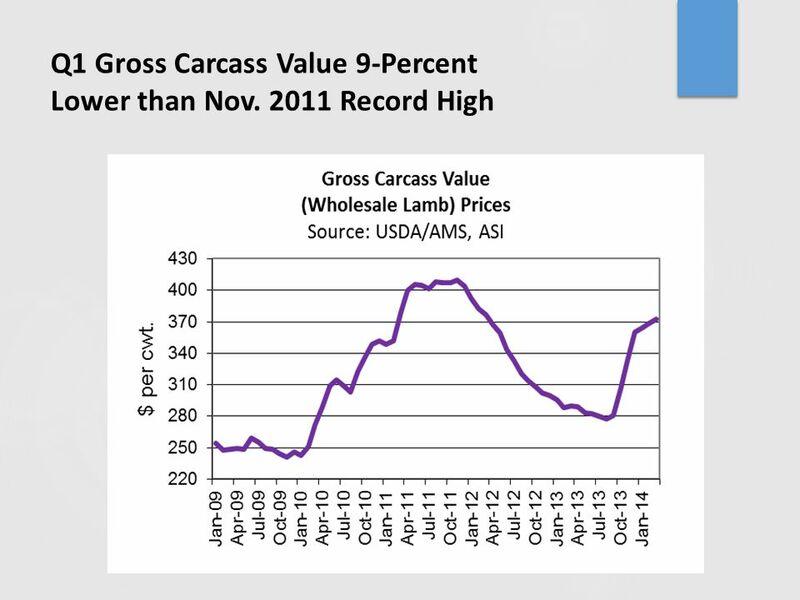 Slaughter lamb prices on a carcass-based formula averaged $300.10/cwt. ($150.05/cwt. live-converted), up 9% quarterly and up 33% year-on-year. Slaughter lambs in live, negotiated sales averaged $159.56/cwt. in the first quarter, up 7% quarterly and up 38% year-on-year. Again, auction averages dropped and formula gains slowed in March. 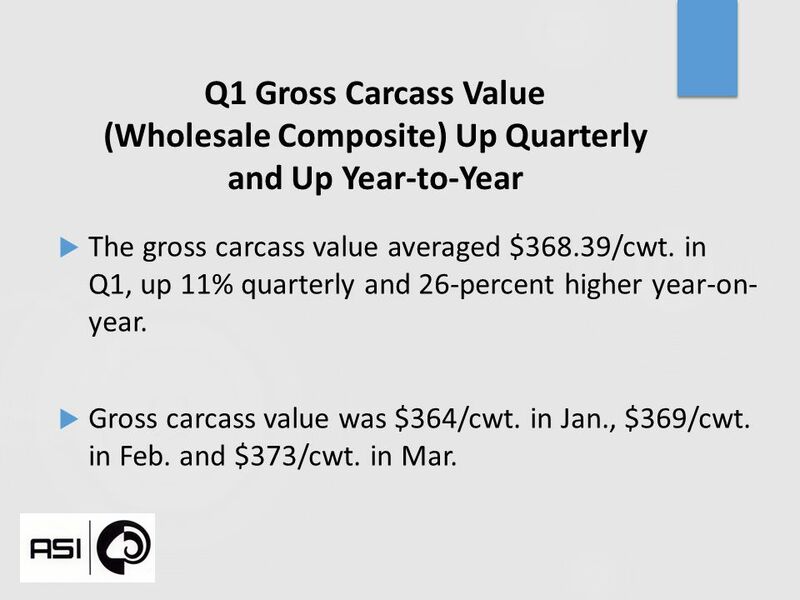 In the Meat Market The gross carcass value (wholesale composite) averaged $368.39/cwt. in the first quarter, up 11% quarterly and 26-percent higher year-on-year. 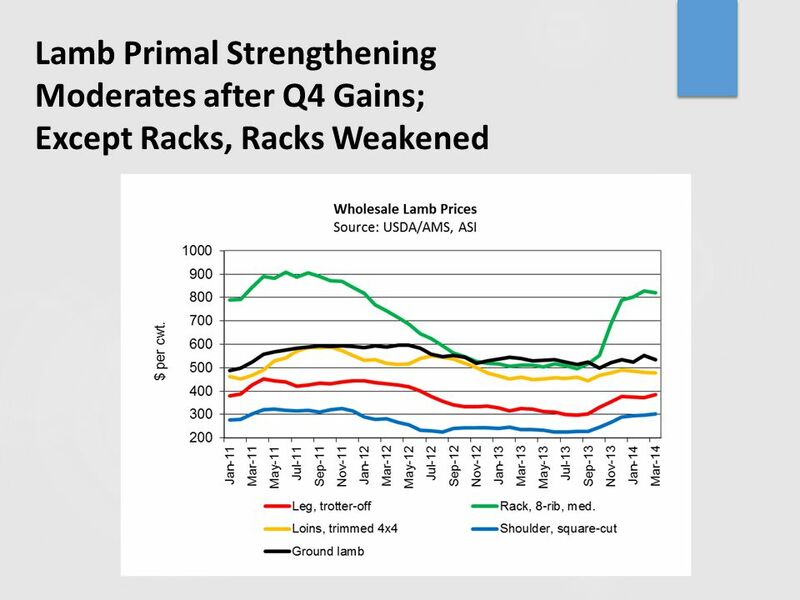 Sharp fourth-quarter gains in lamb primals moderated by the first quarter. 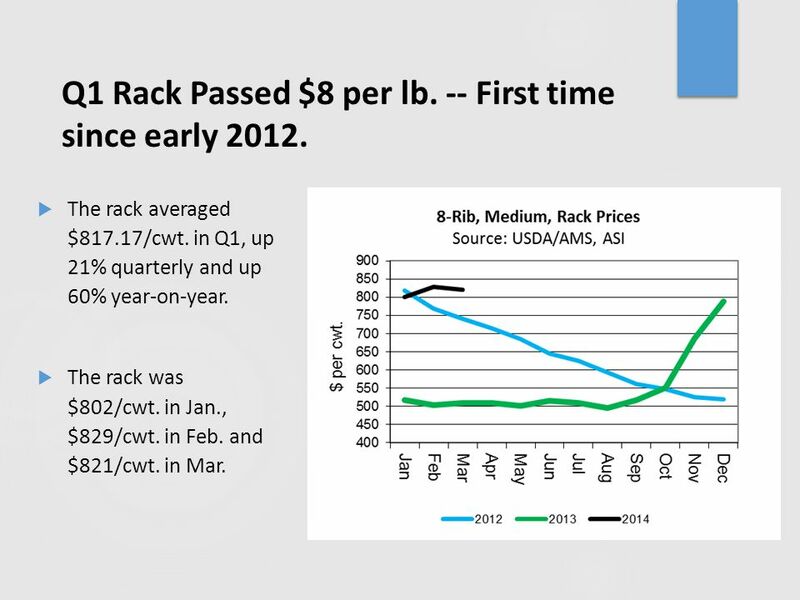 The rack surpassed $8 per lb. in the first quarter for the first time since early 2012. The rack averaged $817.17/cwt., up 21% quarterly and up 60% year-on-year. 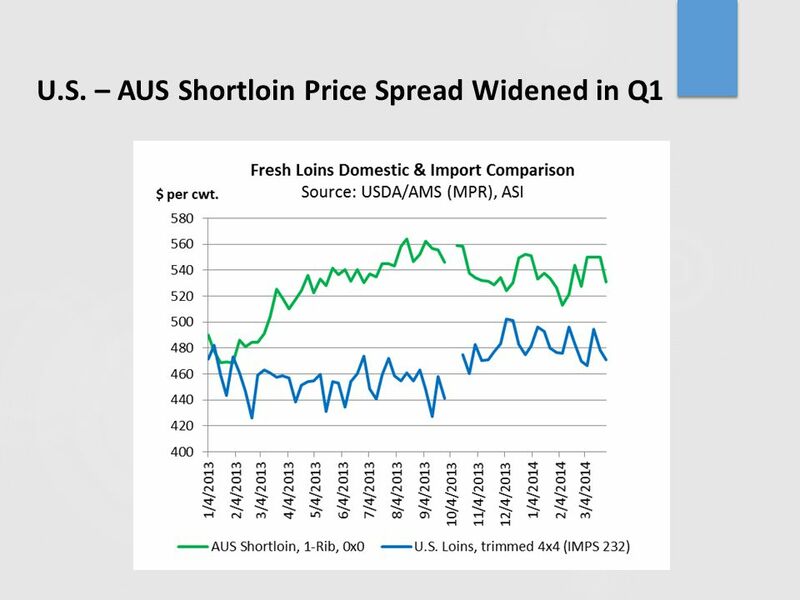 By the first quarter, the loins was still not breaking $5 per lb. 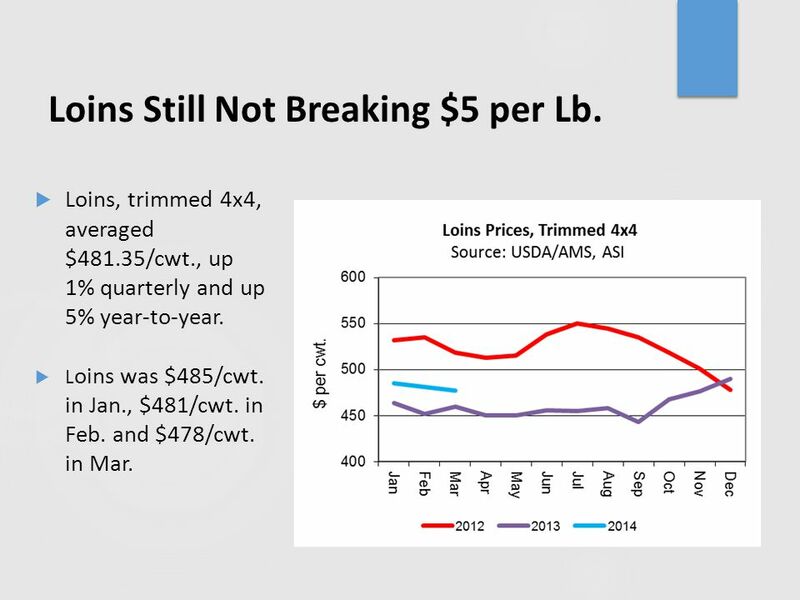 Loins, trimmed 4x4, averaged $481.35/cwt., up 1% quarterly and up 5% year-to-year. The leg saw an Easter boost: it averaged $376.79/cwt., up 6% quarterly and up 17% year-to-year. The shoulder, square- cut, hit a 4-year high in the first quarter. At $296.85/cwt., it was up 11% quarterly and up 23% year-on-year. Ground lamb averaged $535.75/cwt. in the first quarter, up 3% quarterly and down 1% year-on-year. 5 Executive Summary, page 3 Margins Profits are made and lost in the margin. 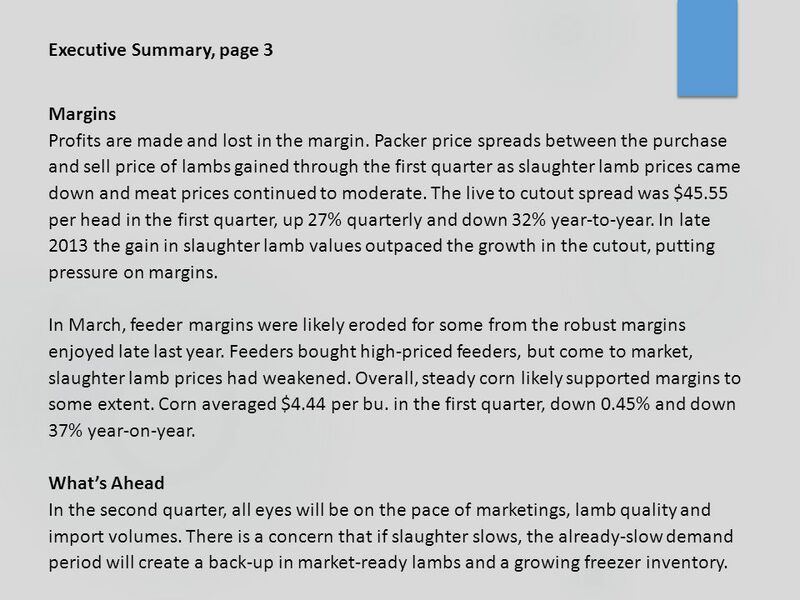 Packer price spreads between the purchase and sell price of lambs gained through the first quarter as slaughter lamb prices came down and meat prices continued to moderate. 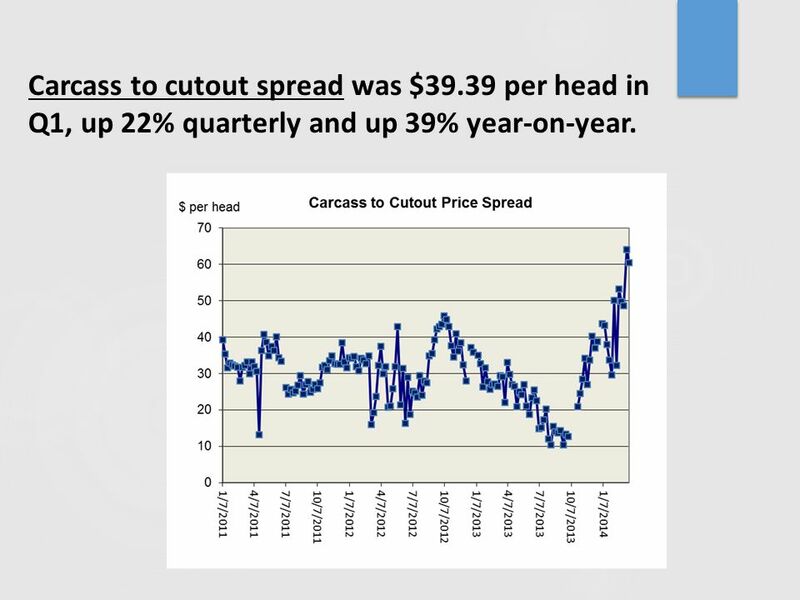 The live to cutout spread was $45.55 per head in the first quarter, up 27% quarterly and down 32% year-to-year. 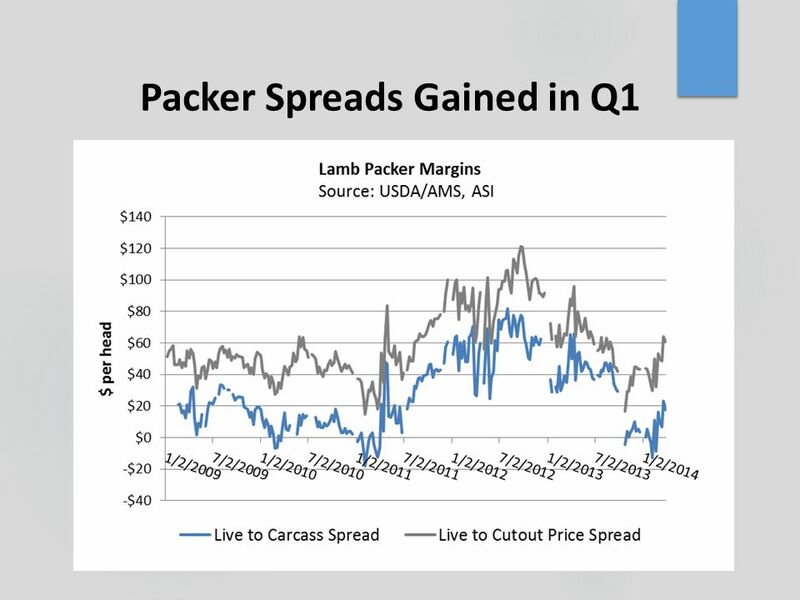 In late 2013 the gain in slaughter lamb values outpaced the growth in the cutout, putting pressure on margins. In March, feeder margins were likely eroded for some from the robust margins enjoyed late last year. 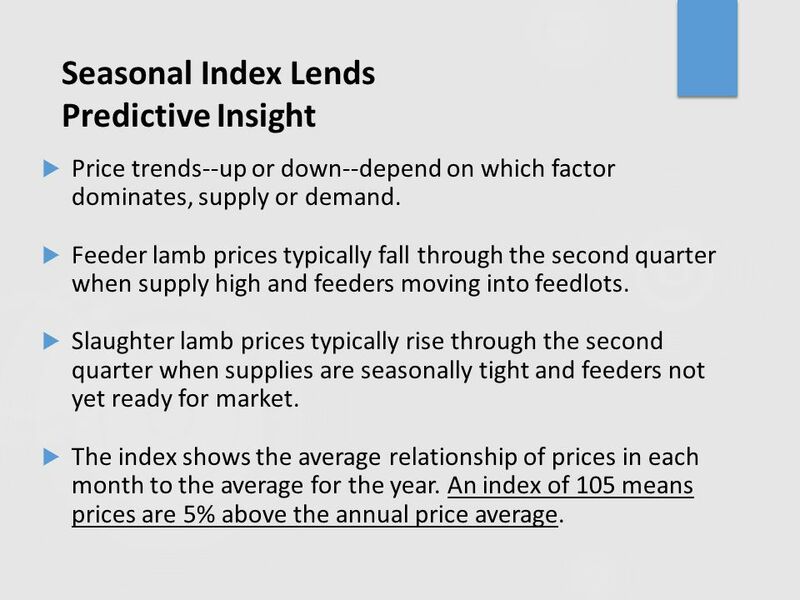 Feeders bought high-priced feeders, but come to market, slaughter lamb prices had weakened. Overall, steady corn likely supported margins to some extent. Corn averaged $4.44 per bu. in the first quarter, down 0.45% and down 37% year-on-year. 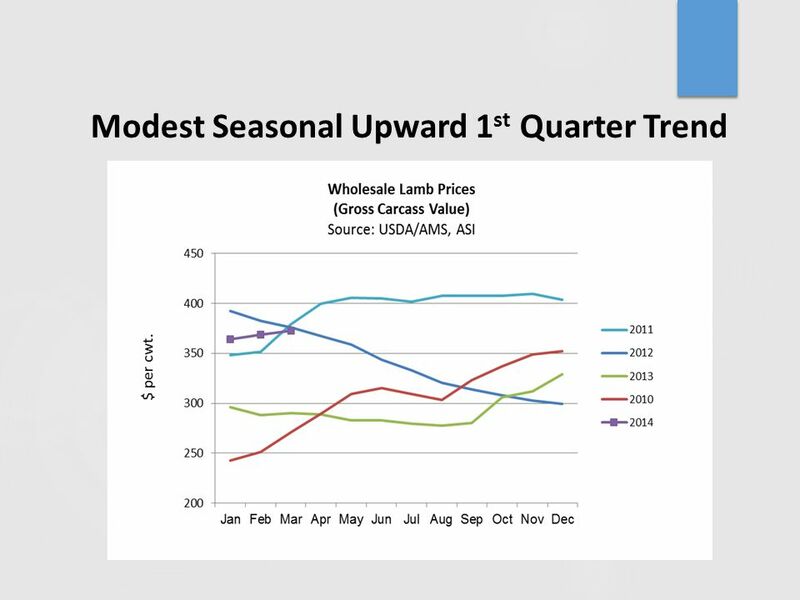 What’s Ahead In the second quarter, all eyes will be on the pace of marketings, lamb quality and import volumes. There is a concern that if slaughter slows, the already-slow demand period will create a back-up in market-ready lambs and a growing freezer inventory. 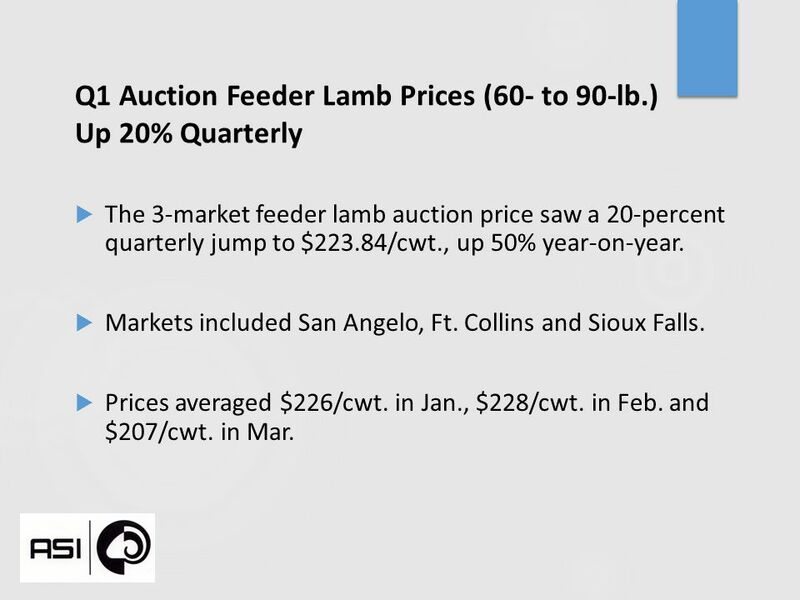 7 Q1 Auction Feeder Lamb Prices (60- to 90-lb.) 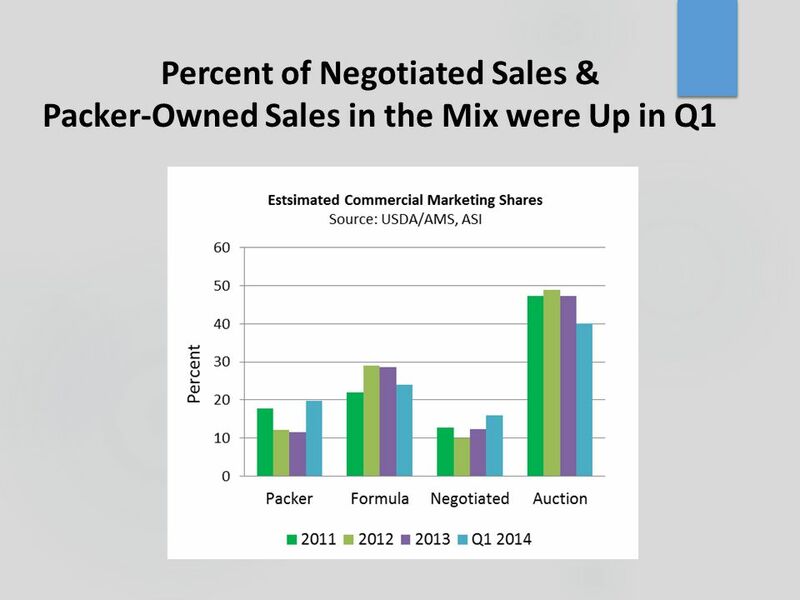 Up 20% Quarterly  The 3-market feeder lamb auction price saw a 20-percent quarterly jump to $223.84/cwt., up 50% year-on-year.  Markets included San Angelo, Ft. Collins and Sioux Falls.  Prices averaged $226/cwt. in Jan., $228/cwt. in Feb. and $207/cwt. in Mar. 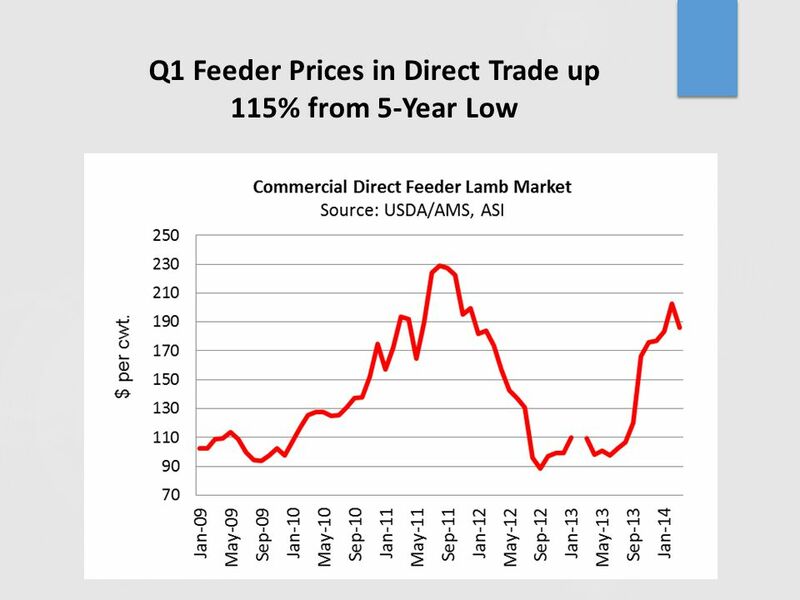 9 Feeder Lambs in Direct Trade Gained 74% Year-on-Year o Feeder lambs averaged $190.68/cwt. in direct trade in Q1, up 10% quarterly, and up 74% year-to-year. o Feeders averaged $184/cwt. in Jan., $203/cwt. in Feb. and $186/cwt. in Mar. 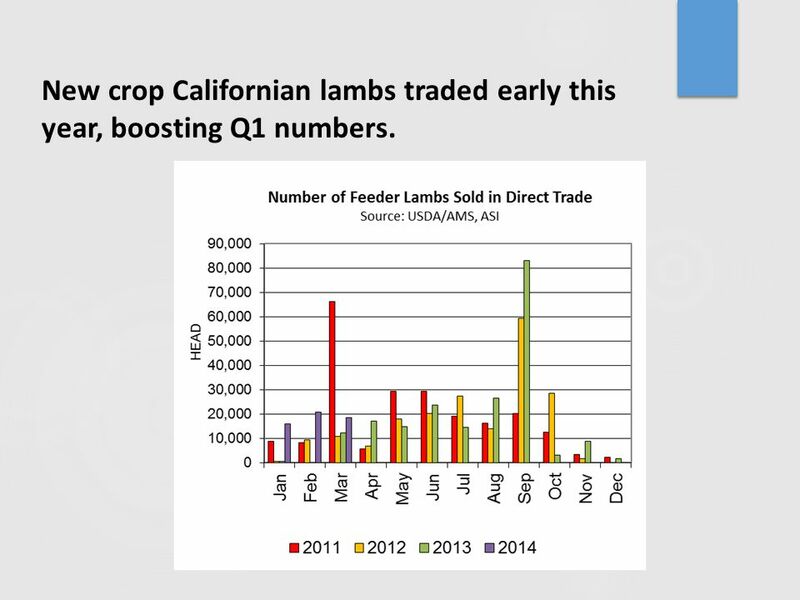 11 New crop Californian lambs traded early this year, boosting Q1 numbers. 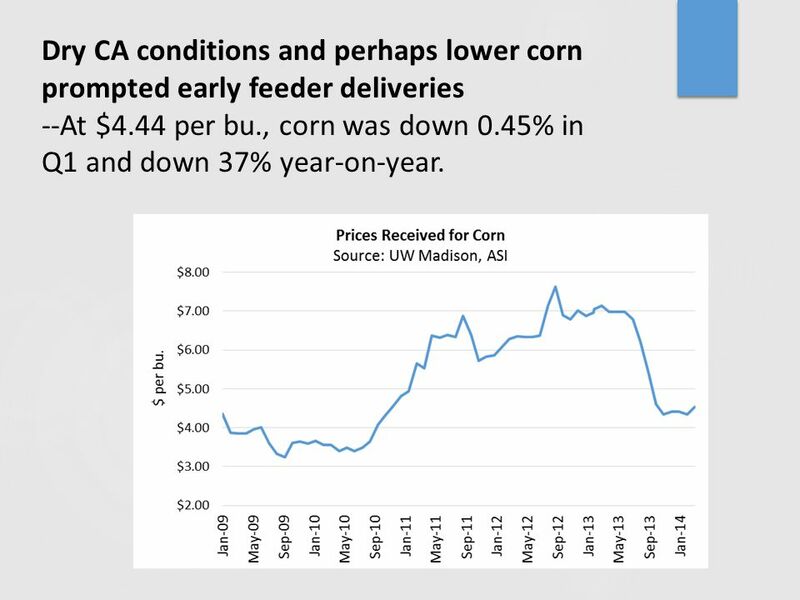 12 Dry CA conditions and perhaps lower corn prompted early feeder deliveries --At $4.44 per bu., corn was down 0.45% in Q1 and down 37% year-on-year. 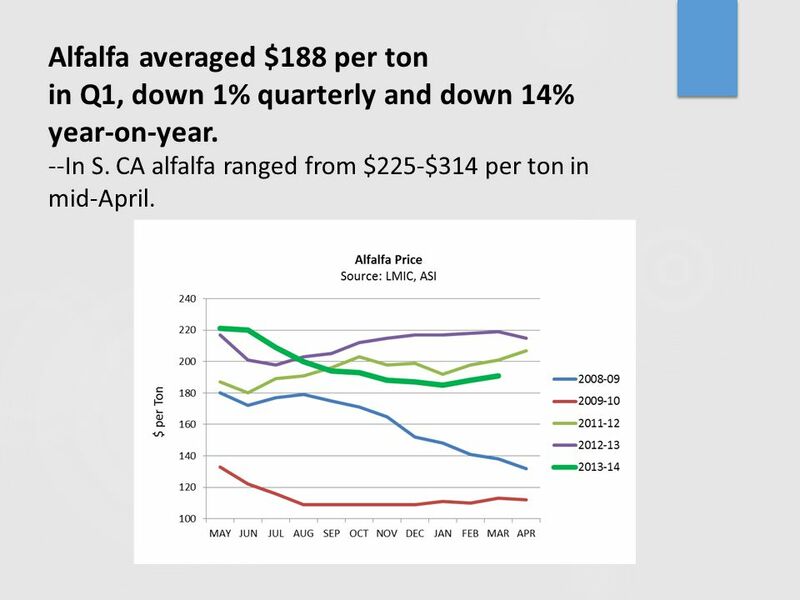 13 Alfalfa averaged $188 per ton in Q1, down 1% quarterly and down 14% year-on-year. --In S. CA alfalfa ranged from $225-$314 per ton in mid-April. 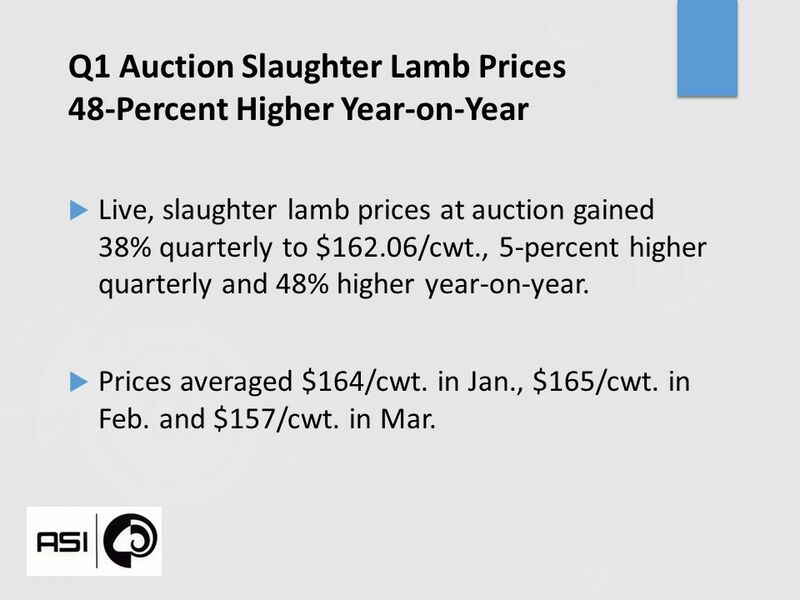 14 Q1 Auction Slaughter Lamb Prices 48-Percent Higher Year-on-Year  Live, slaughter lamb prices at auction gained 38% quarterly to $162.06/cwt., 5-percent higher quarterly and 48% higher year-on-year.  Prices averaged $164/cwt. in Jan., $165/cwt. in Feb. and $157/cwt. in Mar. 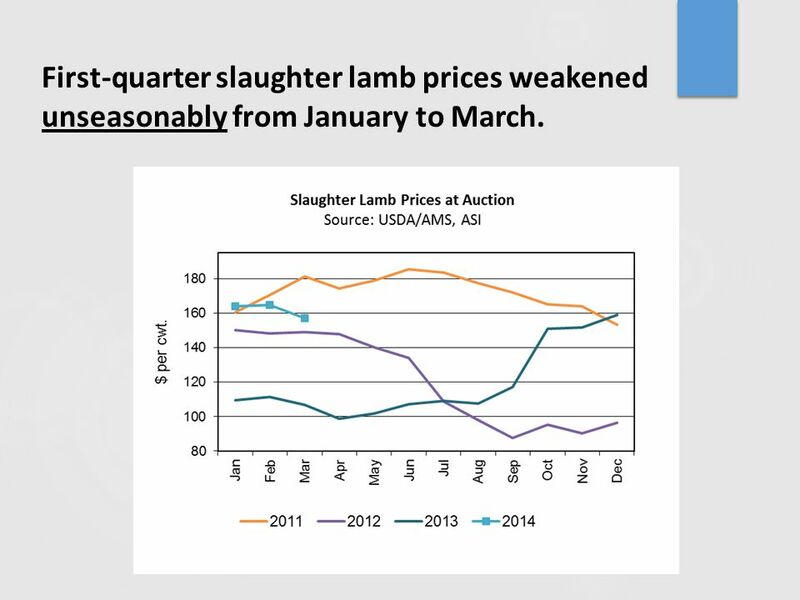 16 First-quarter slaughter lamb prices weakened unseasonably from January to March. 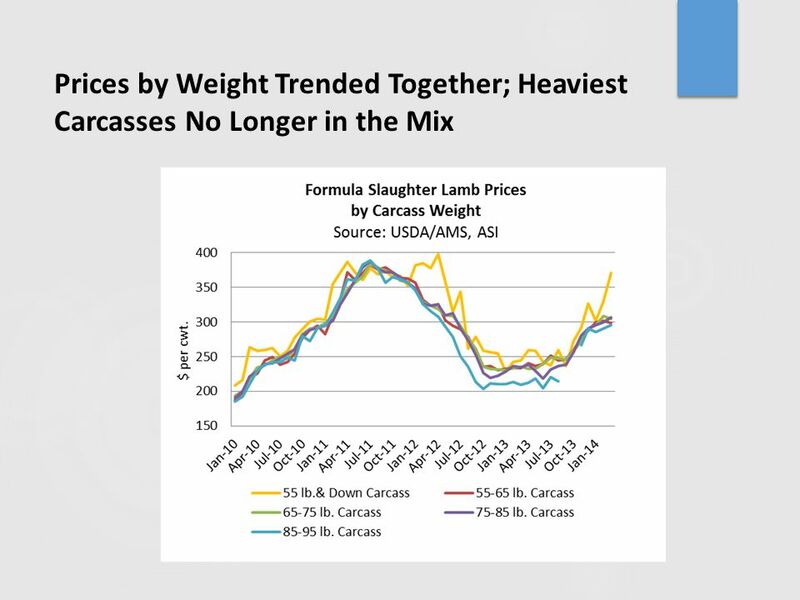 17 Carcass-Based Formula Slaughter Lamb Prices Gained through Q1 2014  Slaughter lamb prices on a carcass-based formula averaged $300.10/cwt. ($150.05/cwt. live- converted), up 9% quarterly and up 33% year-on- year.  Weighted-average prices were $294/cwt. in Jan., $302/cwt. in Feb. and $304/cwt. in Mar. 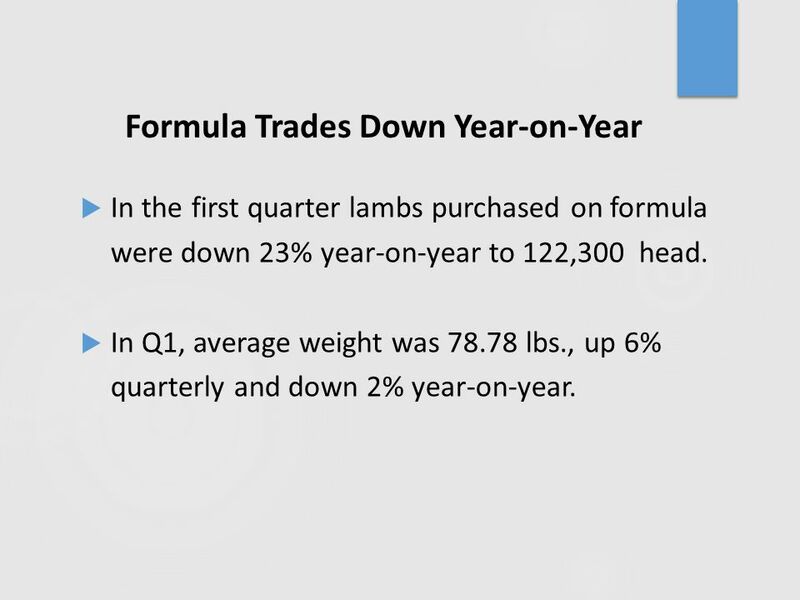 18 Formula Trades Down Year-on-Year  In the first quarter lambs purchased on formula were down 23% year-on-year to 122,300 head.  In Q1, average weight was 78.78 lbs., up 6% quarterly and down 2% year-on-year. 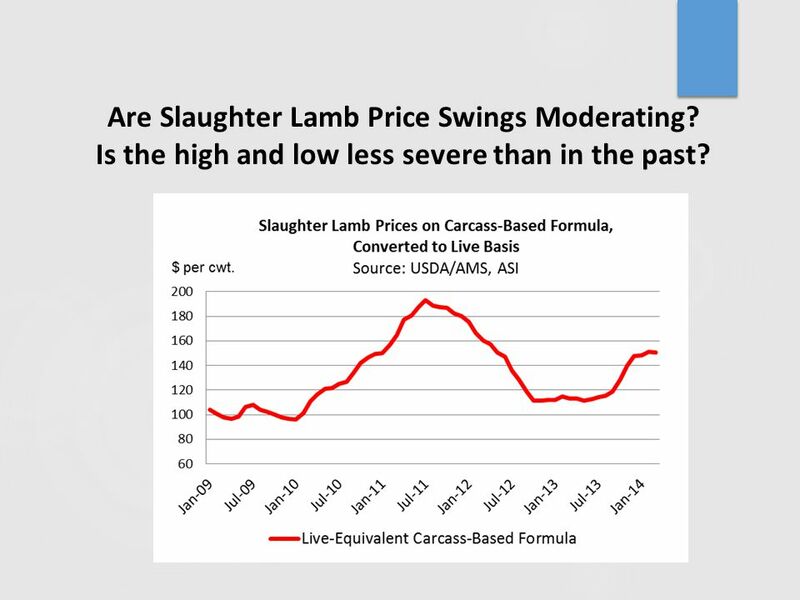 19 Are Slaughter Lamb Price Swings Moderating? Is the high and low less severe than in the past? 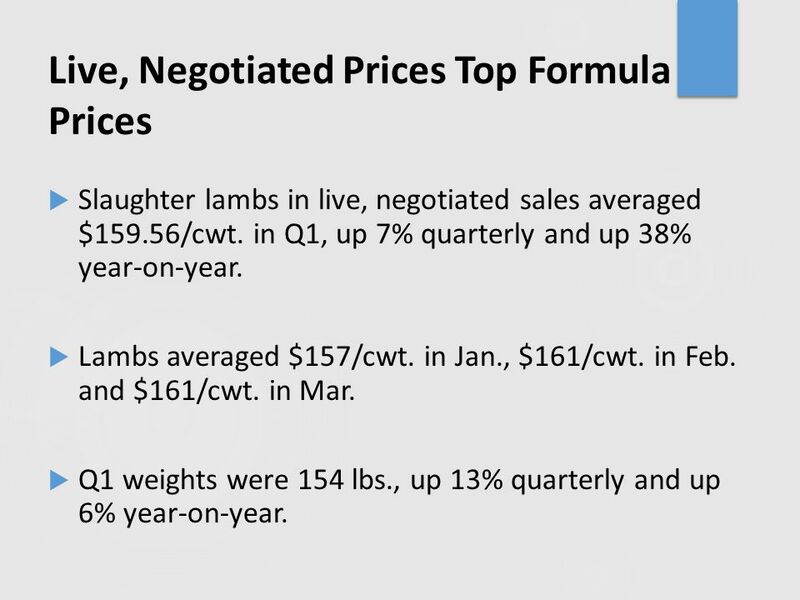 21 Live, Negotiated Prices Top Formula Prices  Slaughter lambs in live, negotiated sales averaged $159.56/cwt. in Q1, up 7% quarterly and up 38% year-on-year.  Lambs averaged $157/cwt. in Jan., $161/cwt. in Feb. and $161/cwt. in Mar.  Q1 weights were 154 lbs., up 13% quarterly and up 6% year-on-year. 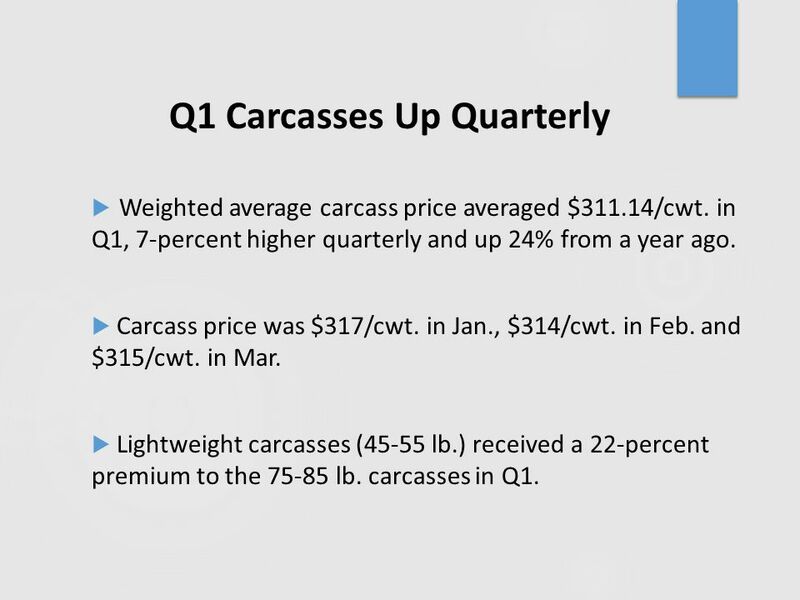 23 Q1 Carcasses Up Quarterly  Weighted average carcass price averaged $311.14/cwt. in Q1, 7-percent higher quarterly and up 24% from a year ago. 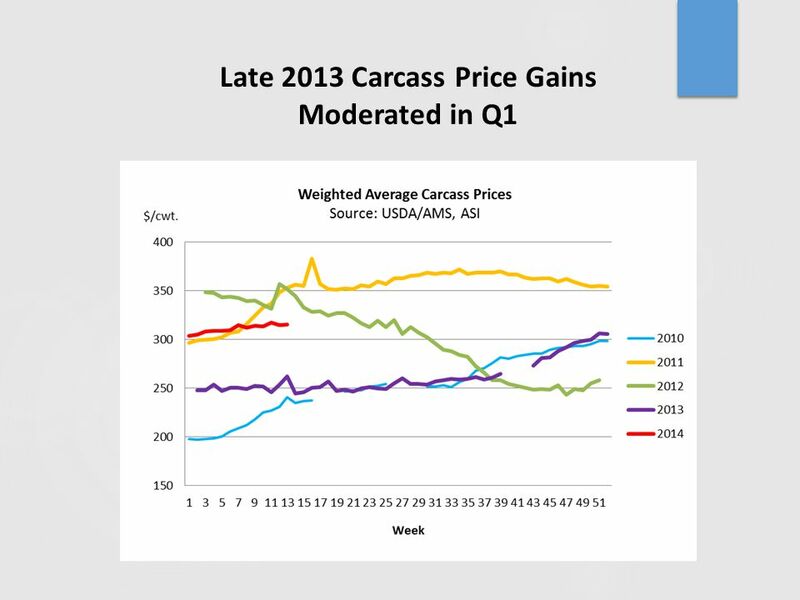  Carcass price was $317/cwt. in Jan., $314/cwt. in Feb. and $315/cwt. in Mar.  Lightweight carcasses (45-55 lb.) received a 22-percent premium to the 75-85 lb. carcasses in Q1. 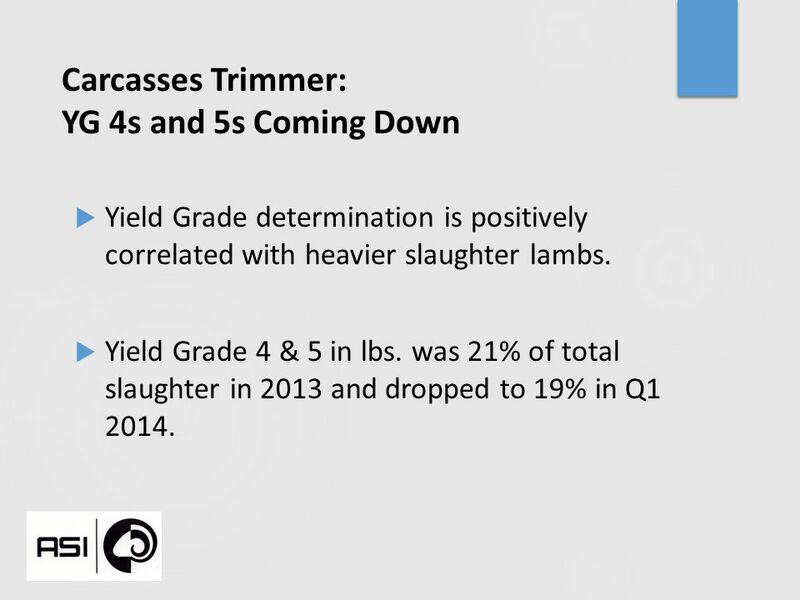 27 Carcasses Trimmer: YG 4s and 5s Coming Down  Yield Grade determination is positively correlated with heavier slaughter lambs.  Yield Grade 4 & 5 in lbs. was 21% of total slaughter in 2013 and dropped to 19% in Q1 2014. 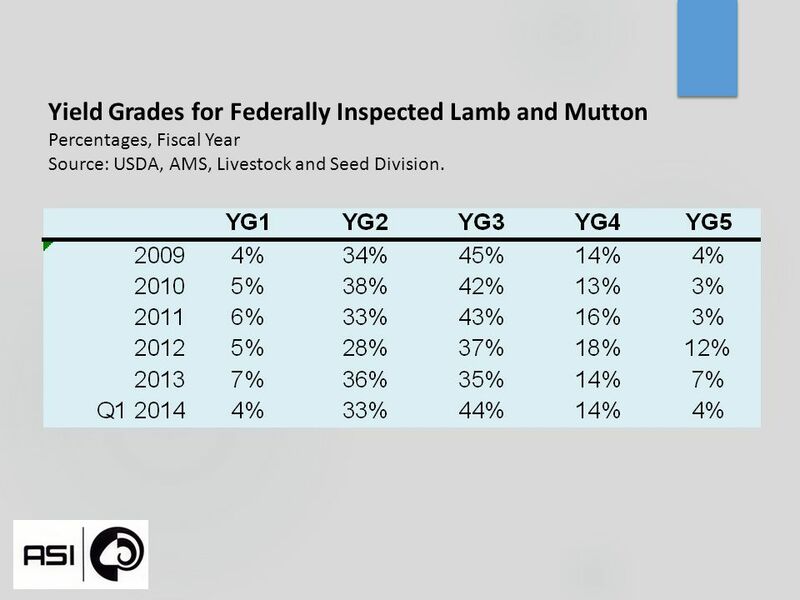 28 Yield Grades for Federally Inspected Lamb and Mutton Percentages, Fiscal Year Source: USDA, AMS, Livestock and Seed Division. 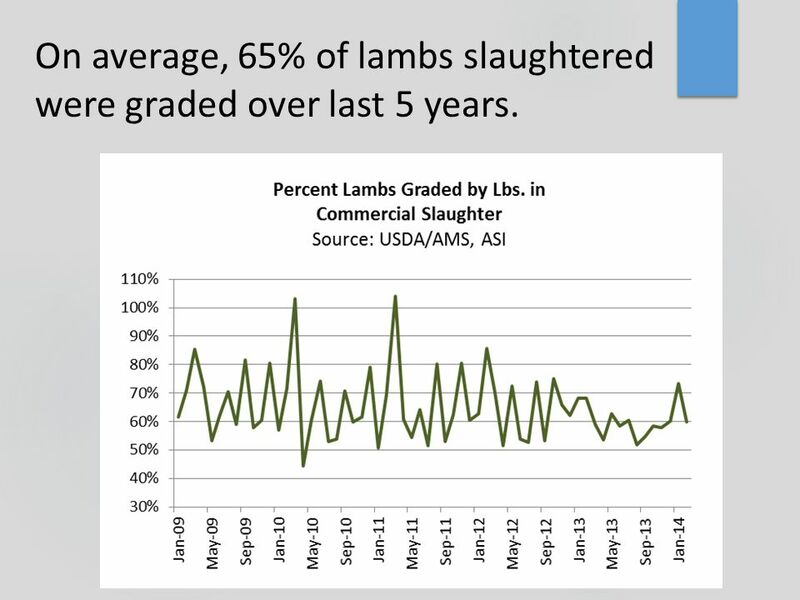 29 On average, 65% of lambs slaughtered were graded over last 5 years. 35 Q1 Rack Passed $8 per lb. -- First time since early 2012.  The rack averaged $817.17/cwt. in Q1, up 21% quarterly and up 60% year-on-year.  The rack was $802/cwt. in Jan., $829/cwt. in Feb. and $821/cwt. in Mar. 36 Loins Still Not Breaking $5 per Lb.  Loins, trimmed 4x4, averaged $481.35/cwt., up 1% quarterly and up 5% year-to-year.  L oins was $485/cwt. in Jan., $481/cwt. in Feb. and $478/cwt. in Mar. 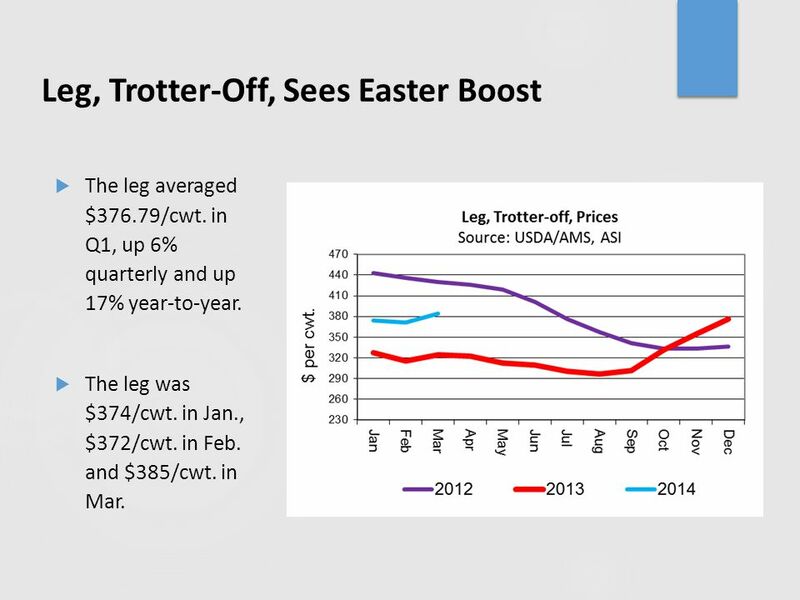 37 Leg, Trotter-Off, Sees Easter Boost  The leg averaged $376.79/cwt. in Q1, up 6% quarterly and up 17% year-to-year.  The leg was $374/cwt. in Jan., $372/cwt. in Feb. and $385/cwt. in Mar. 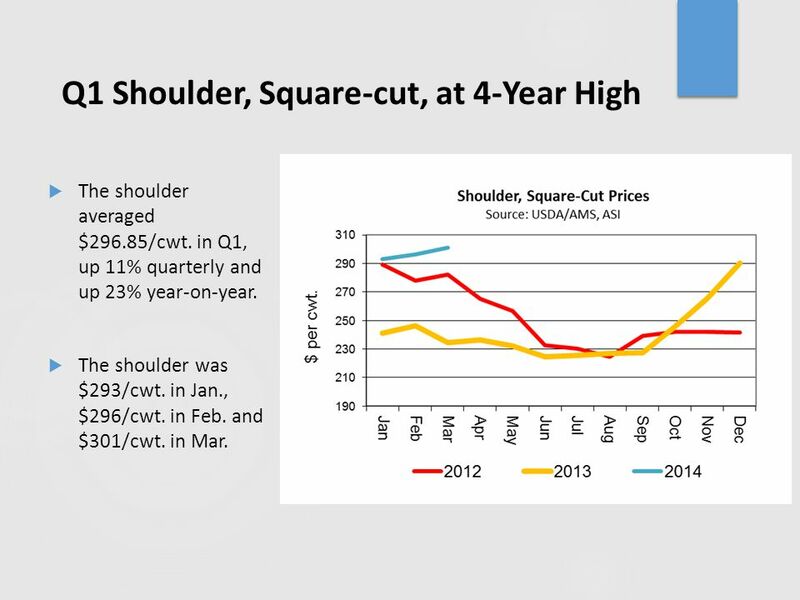 38 Q1 Shoulder, Square-cut, at 4-Year High  The shoulder averaged $296.85/cwt. in Q1, up 11% quarterly and up 23% year-on-year. 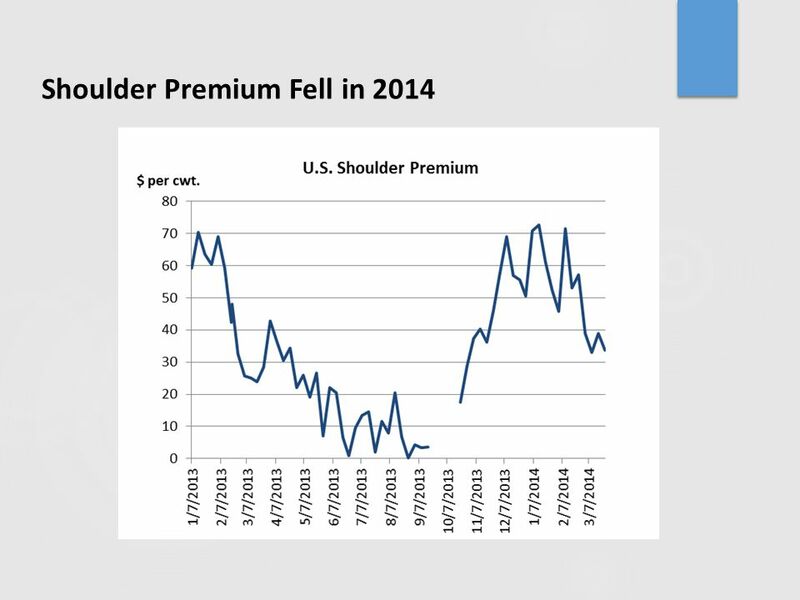  The shoulder was $293/cwt. in Jan., $296/cwt. in Feb. and $301/cwt. in Mar. 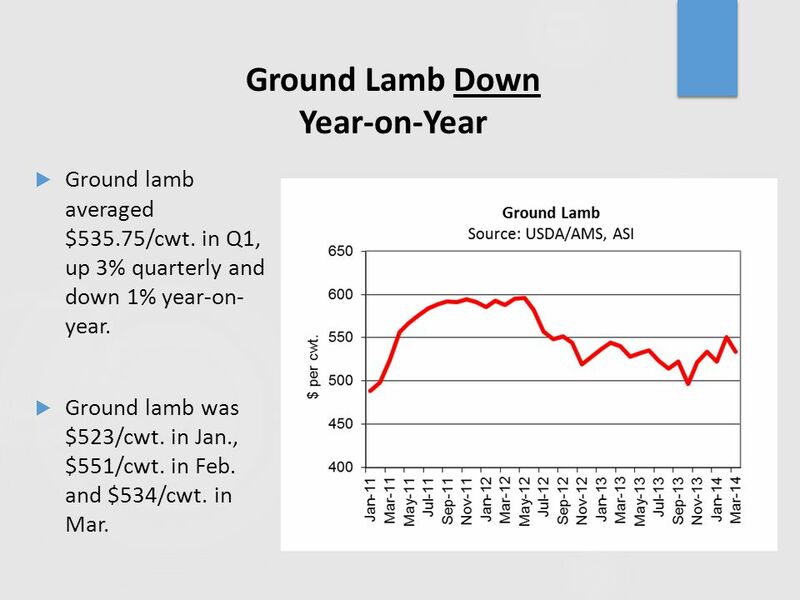 39 Ground Lamb Down Year-on-Year  Ground lamb averaged $535.75/cwt. in Q1, up 3% quarterly and down 1% year-on- year.  Ground lamb was $523/cwt. in Jan., $551/cwt. in Feb. and $534/cwt. in Mar. 41 Food Service Sector Growth up in March, but Down Quarterly  Restaurant Industry News reported that same-store sales grew 0.7 percent in March — a strong 1.4-percent improvement from the 0.7-percent decline reported in February and the first growth since November 2013 (4/14/14).  The positive March result, however, was not enough to pull the industry’s same-store sales growth into positive territory for the first quarter of 2014.  Same-store sales fell 0.2 percent for the first quarter of 2014. 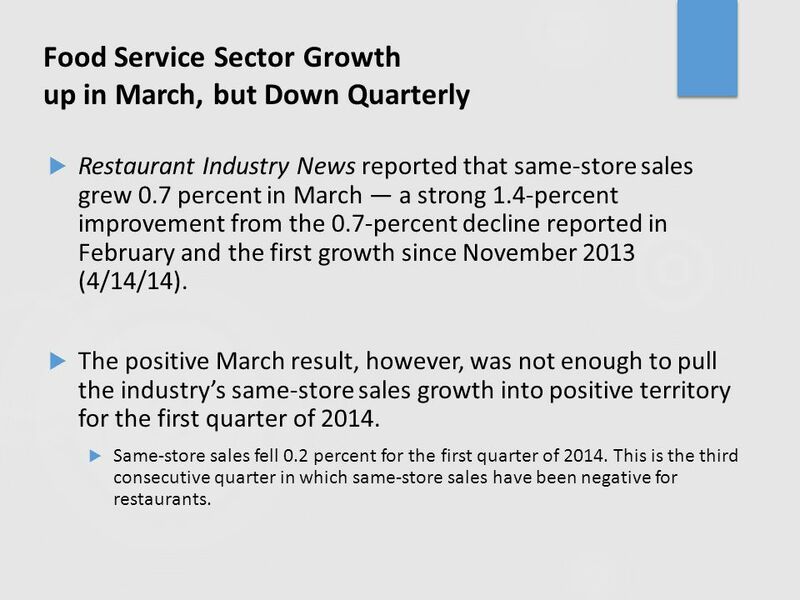 This is the third consecutive quarter in which same-store sales have been negative for restaurants. 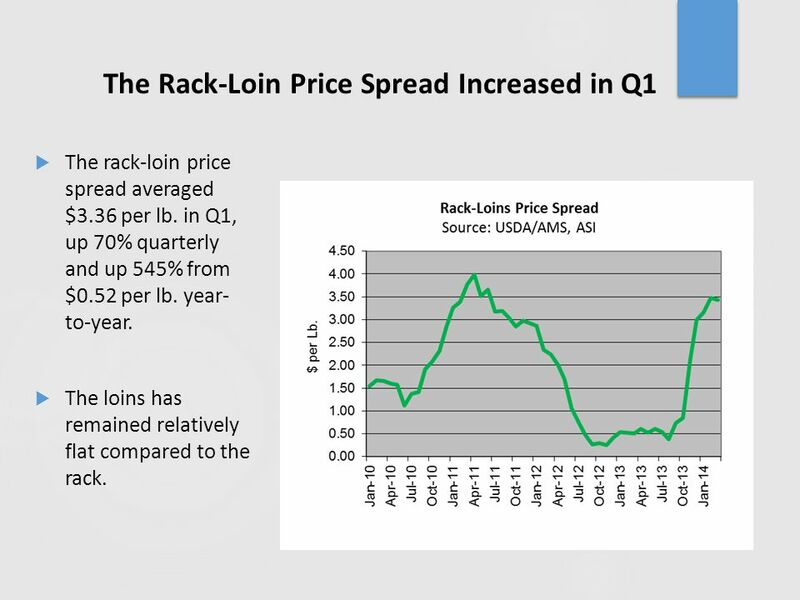 44 The Rack-Loin Price Spread Increased in Q1  The rack-loin price spread averaged $3.36 per lb. in Q1, up 70% quarterly and up 545% from $0.52 per lb. year- to-year.  The loins has remained relatively flat compared to the rack. 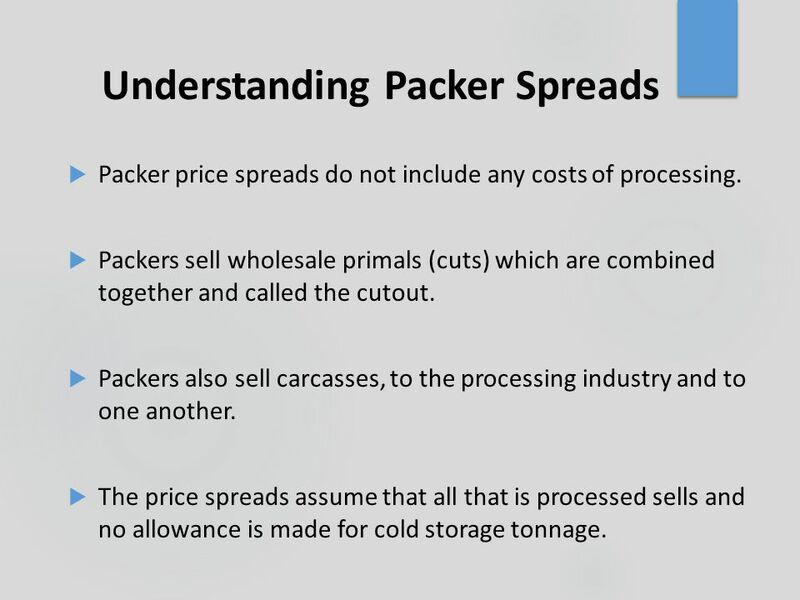 45 Understanding Packer Spreads  Packer price spreads do not include any costs of processing.  Packers sell wholesale primals (cuts) which are combined together and called the cutout.  Packers also sell carcasses, to the processing industry and to one another.  The price spreads assume that all that is processed sells and no allowance is made for cold storage tonnage. 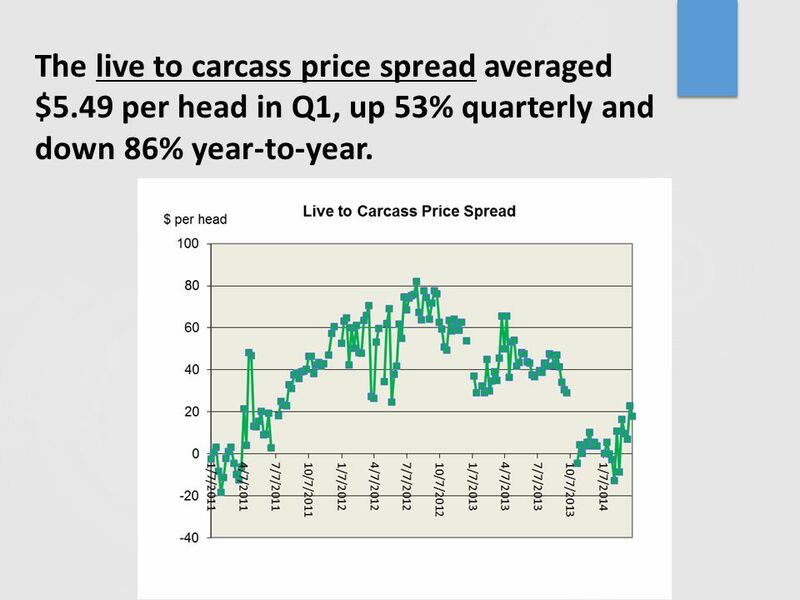 47 The live to carcass price spread averaged $5.49 per head in Q1, up 53% quarterly and down 86% year-to-year. 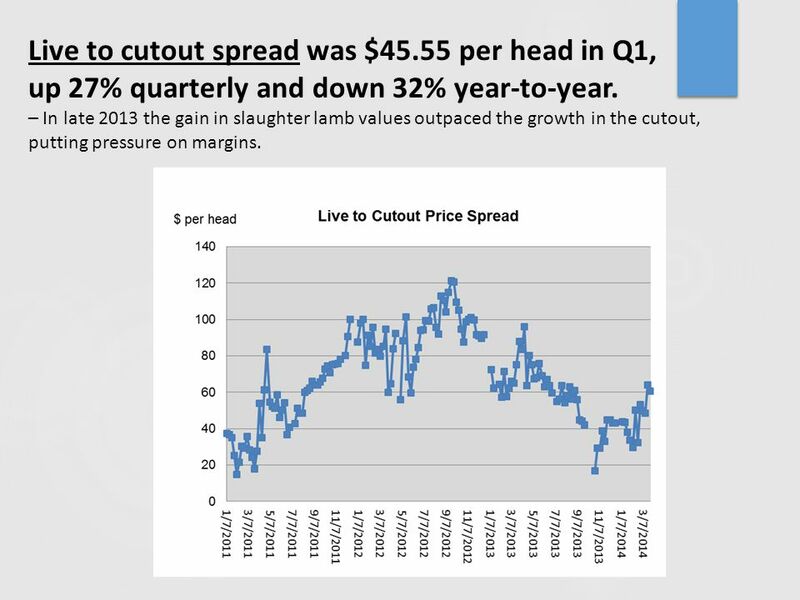 48 Live to cutout spread was $45.55 per head in Q1, up 27% quarterly and down 32% year-to-year. 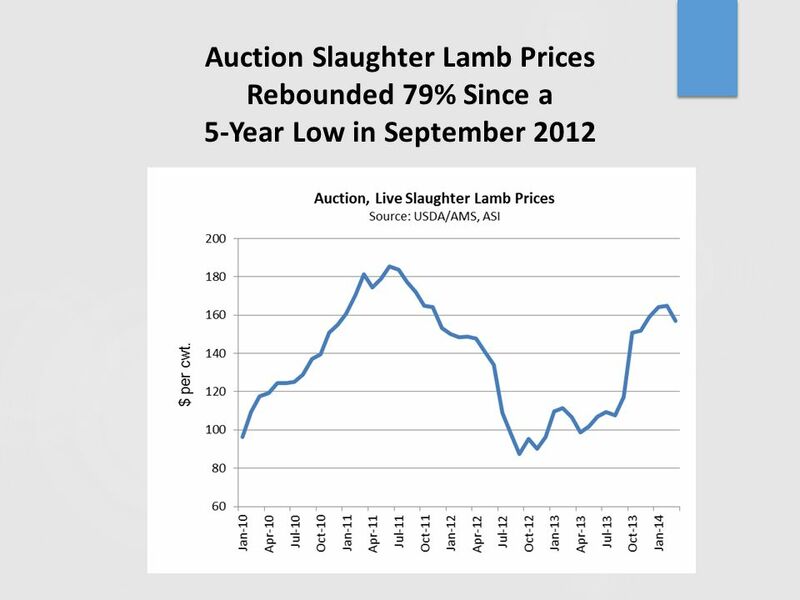 – In late 2013 the gain in slaughter lamb values outpaced the growth in the cutout, putting pressure on margins. 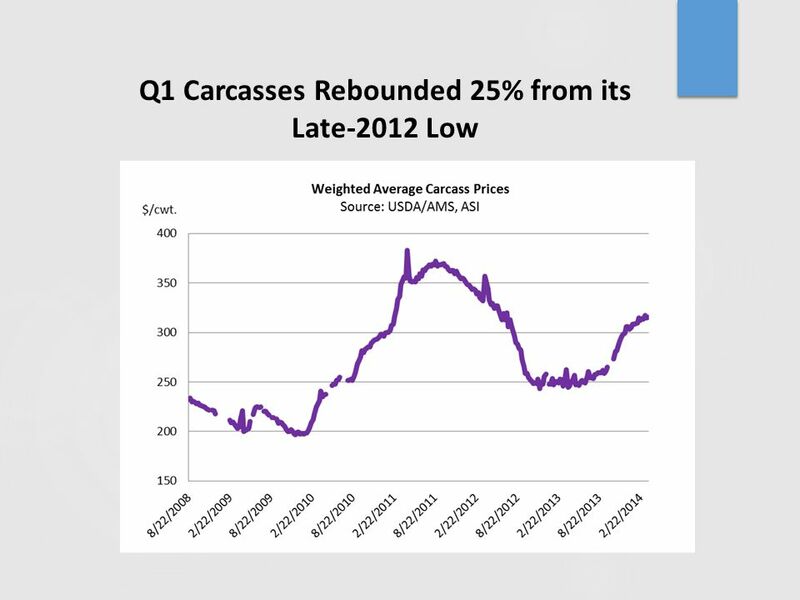 49 Carcass to cutout spread was $39.39 per head in Q1, up 22% quarterly and up 39% year-on-year. 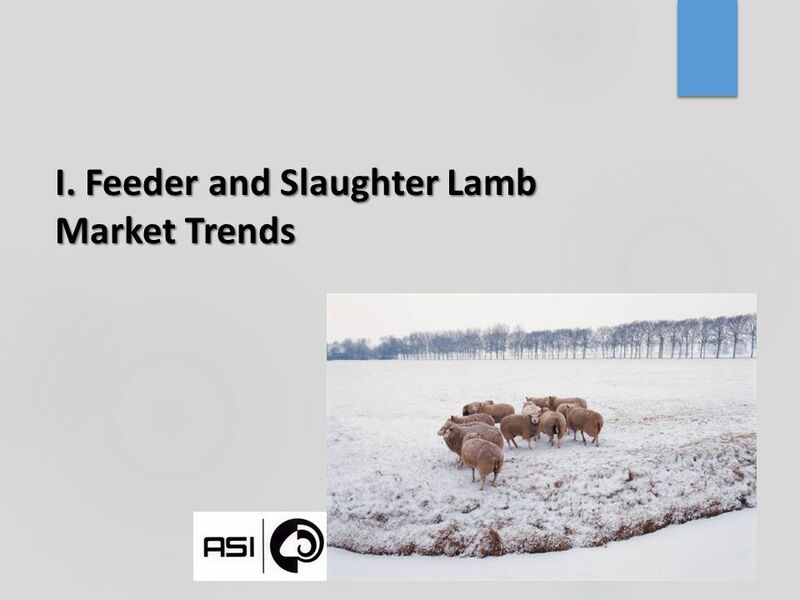 50 Break-Even Analysis  After many feeders made money in the fourth quarter of 2013, feeder margins for some might be back in the red by March 2014 when slaughter lamb prices weakened. 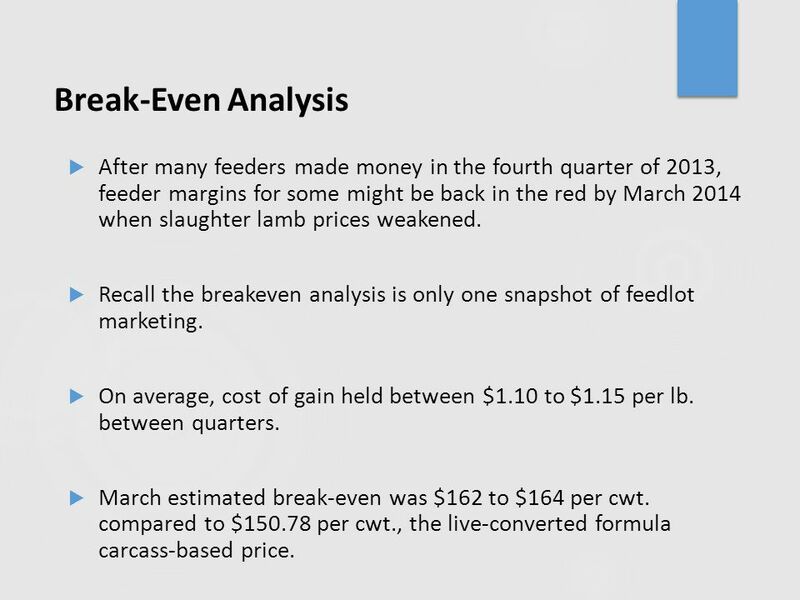  Recall the breakeven analysis is only one snapshot of feedlot marketing. 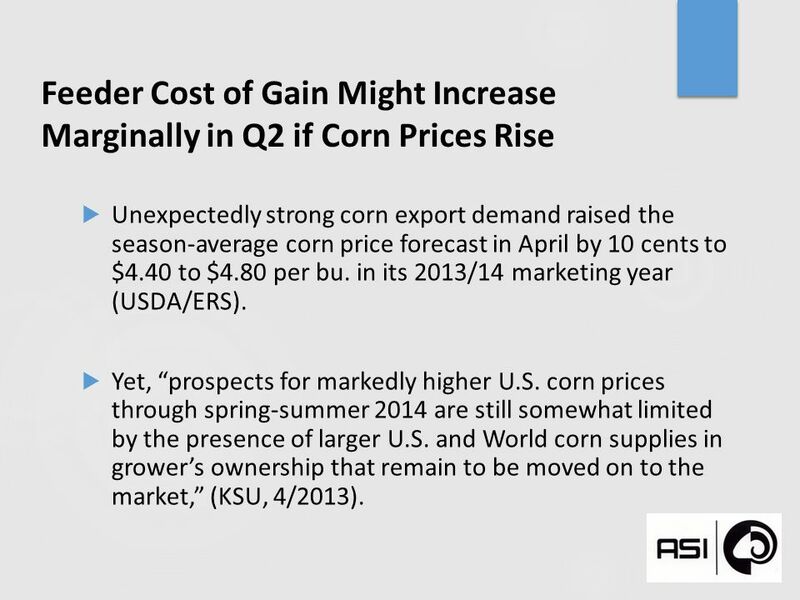  On average, cost of gain held between $1.10 to $1.15 per lb. between quarters.  March estimated break-even was $162 to $164 per cwt. 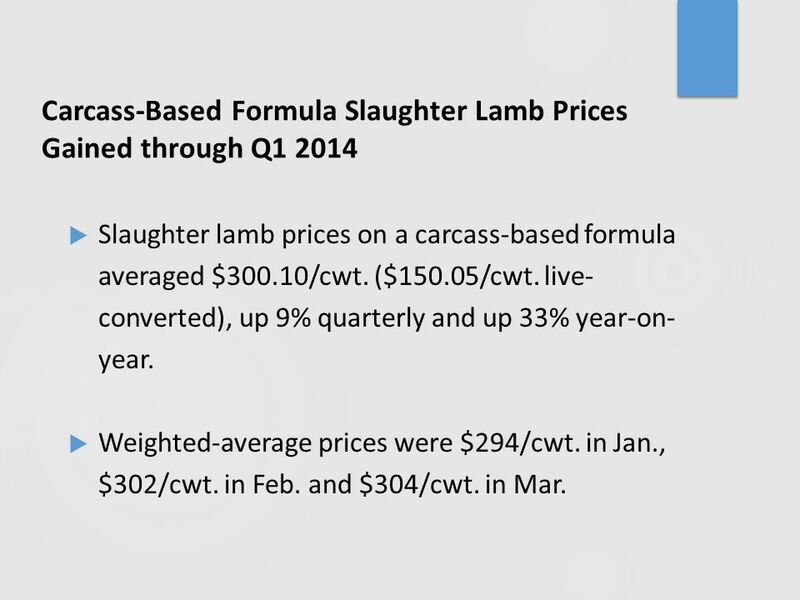 compared to $150.78 per cwt., the live-converted formula carcass-based price. 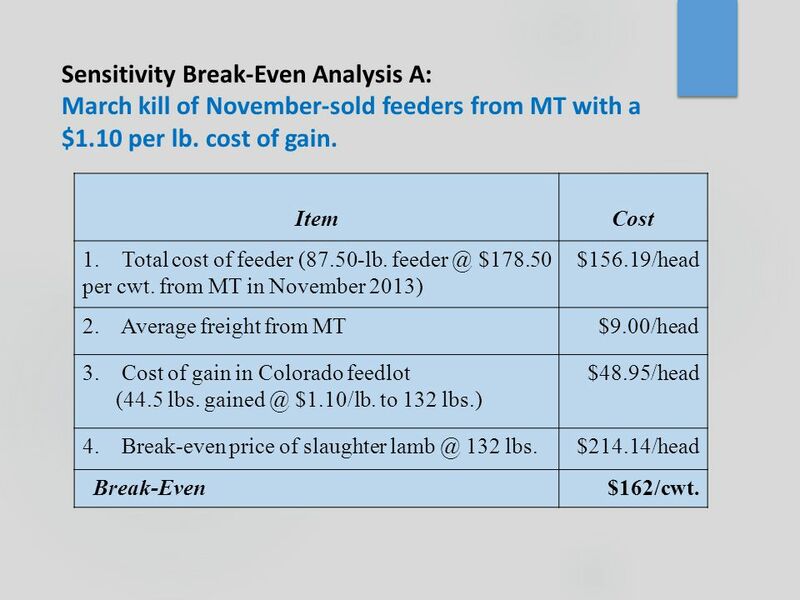 51 Sensitivity Break-Even Analysis A: March kill of November-sold feeders from MT with a $1.10 per lb. cost of gain. ItemCost 1. Total cost of feeder (87.50-lb. feeder @ $178.50 per cwt. from MT in November 2013) $156.19/head 2. Average freight from MT$9.00/head 3. Cost of gain in Colorado feedlot (44.5 lbs. gained @ $1.10/lb. to 132 lbs.) $48.95/head 4. Break-even price of slaughter lamb @ 132 lbs.$214.14/head Break-Even$162/cwt. 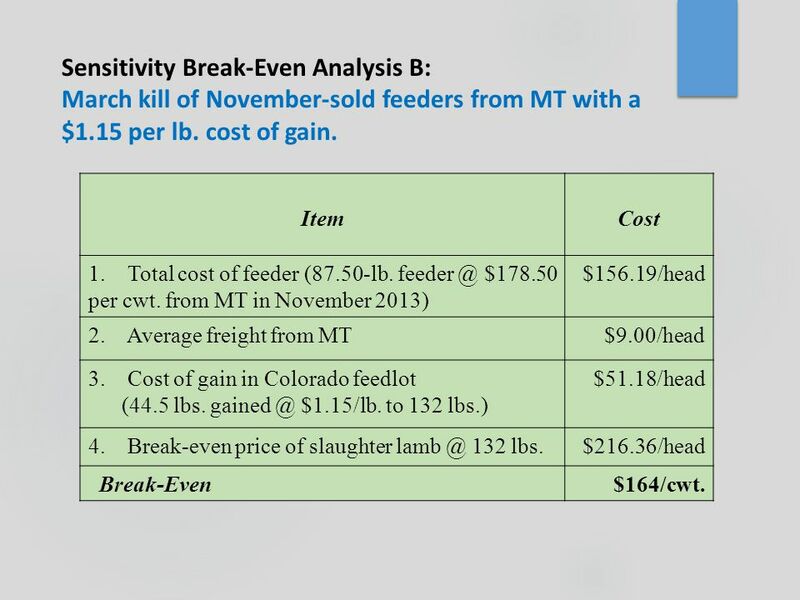 52 Sensitivity Break-Even Analysis B: March kill of November-sold feeders from MT with a $1.15 per lb. cost of gain. ItemCost 1. Total cost of feeder (87.50-lb. feeder @ $178.50 per cwt. from MT in November 2013) $156.19/head 2. Average freight from MT$9.00/head 3. Cost of gain in Colorado feedlot (44.5 lbs. gained @ $1.15/lb. to 132 lbs.) $51.18/head 4. Break-even price of slaughter lamb @ 132 lbs.$216.36/head Break-Even$164/cwt. 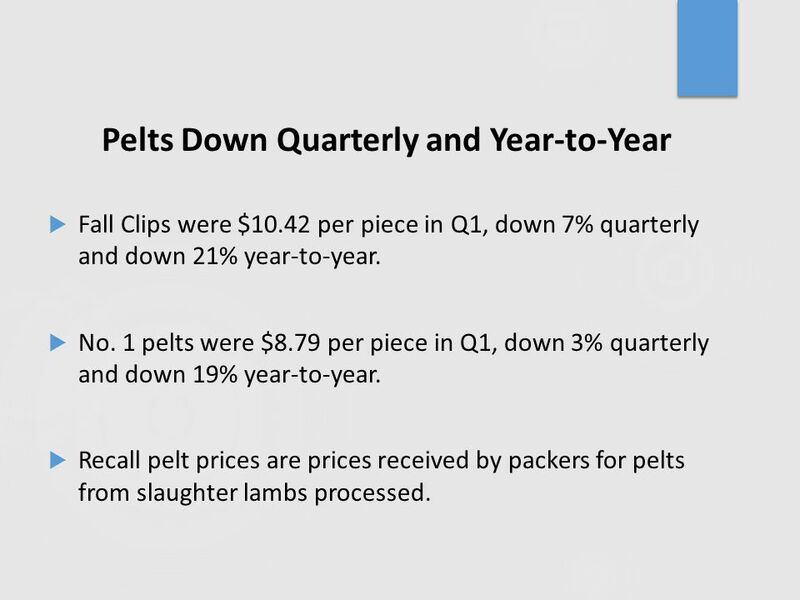 54 Pelts Down Quarterly and Year-to-Year  Fall Clips were $10.42 per piece in Q1, down 7% quarterly and down 21% year-to-year.  No. 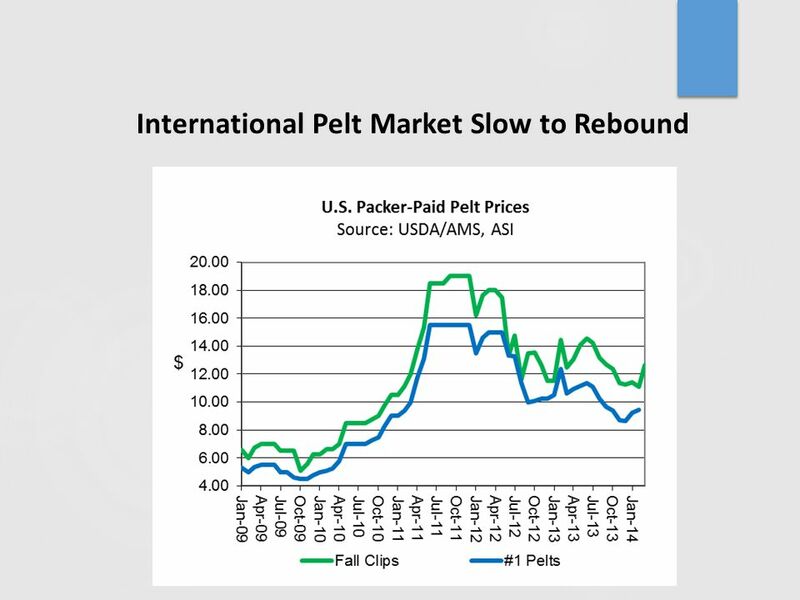 1 pelts were $8.79 per piece in Q1, down 3% quarterly and down 19% year-to-year. 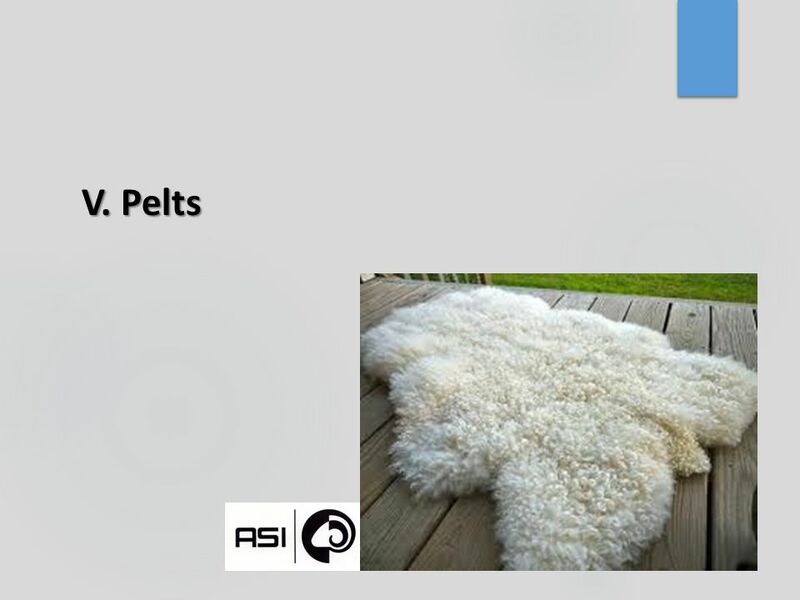  Recall pelt prices are prices received by packers for pelts from slaughter lambs processed. 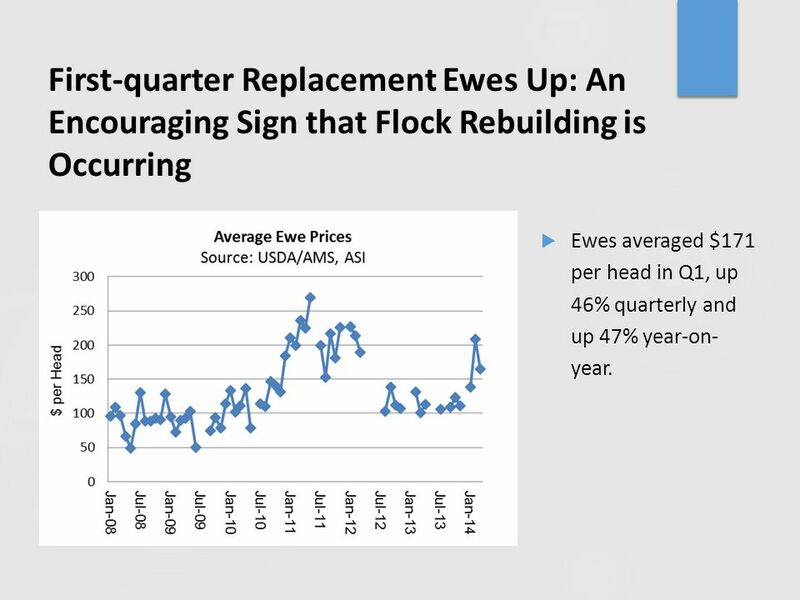 57 First-quarter Replacement Ewes Up: An Encouraging Sign that Flock Rebuilding is Occurring  Ewes averaged $171 per head in Q1, up 46% quarterly and up 47% year-on- year. 58 VII. 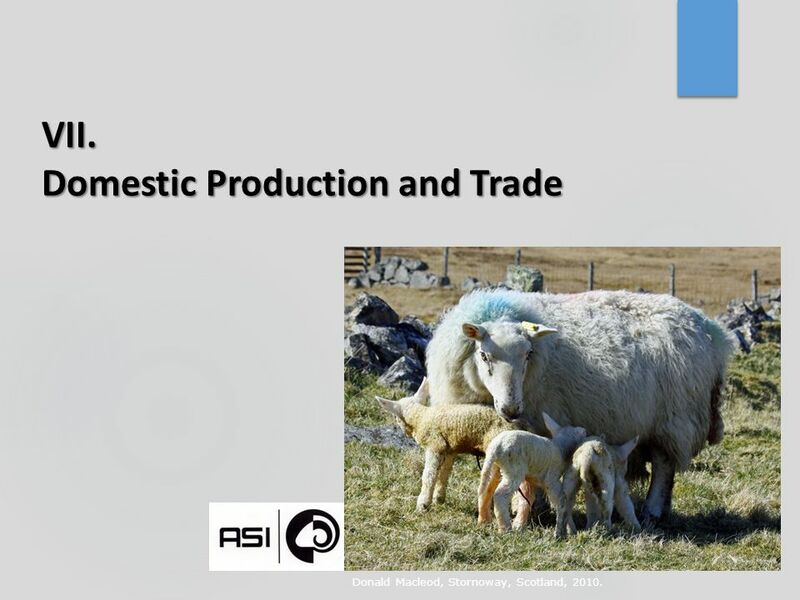 Domestic Production and Trade Donald Macleod, Stornoway, Scotland, 2010. 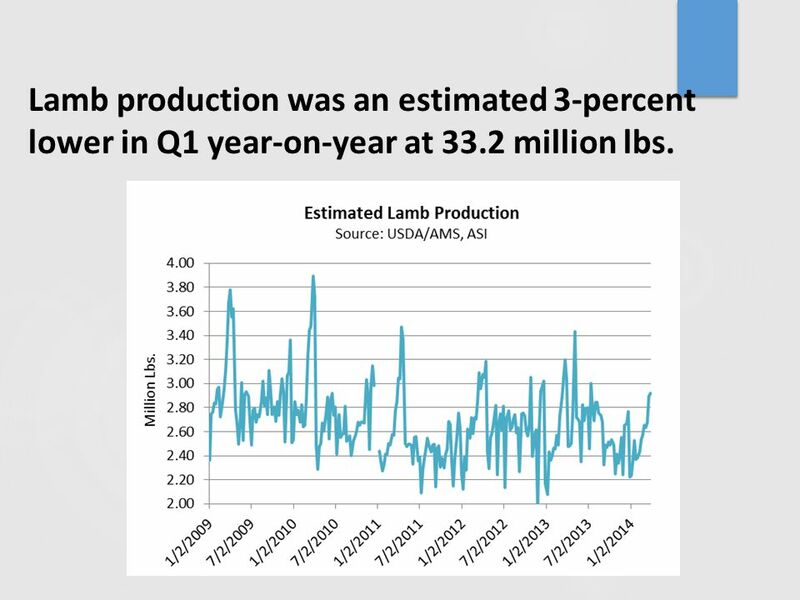 60 Lamb production was an estimated 3-percent lower in Q1 year-on-year at 33.2 million lbs. 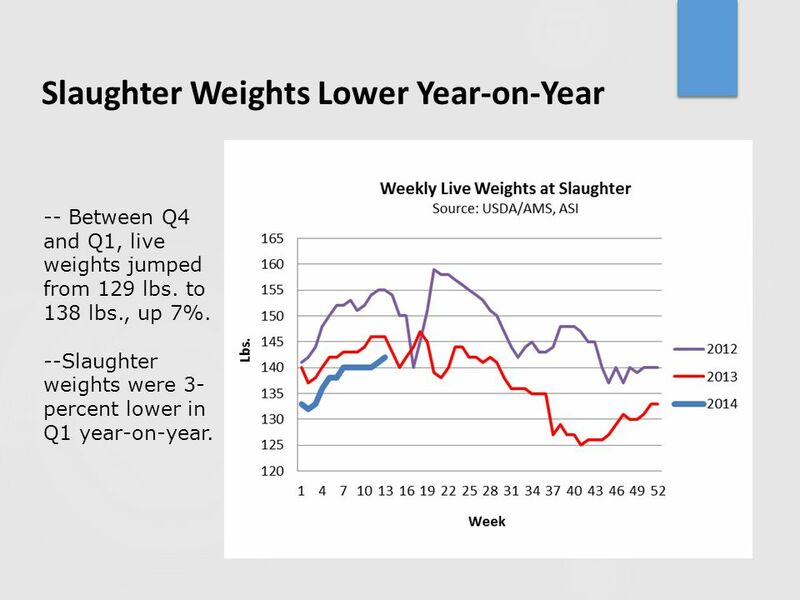 61 Slaughter Weights Lower Year-on-Year -- Between Q4 and Q1, live weights jumped from 129 lbs. to 138 lbs., up 7%. 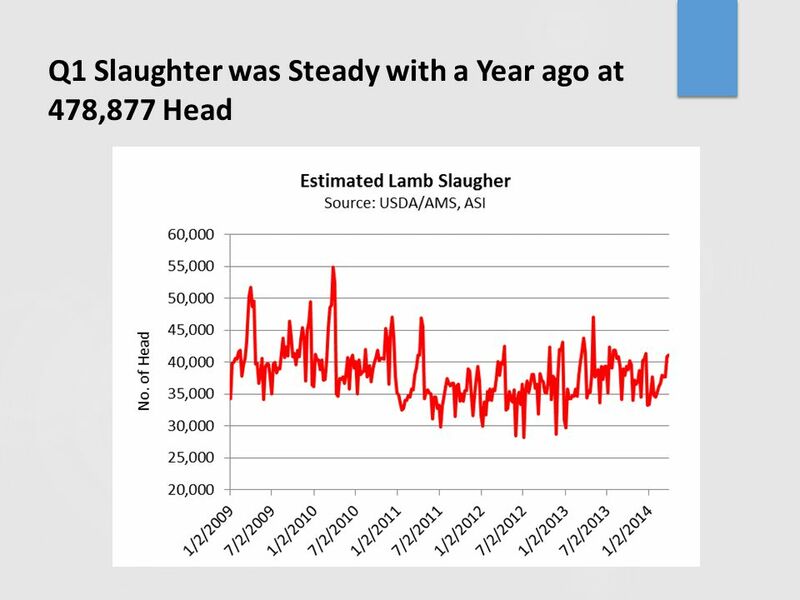 --Slaughter weights were 3- percent lower in Q1 year-on-year. 62 At 28 Mill. 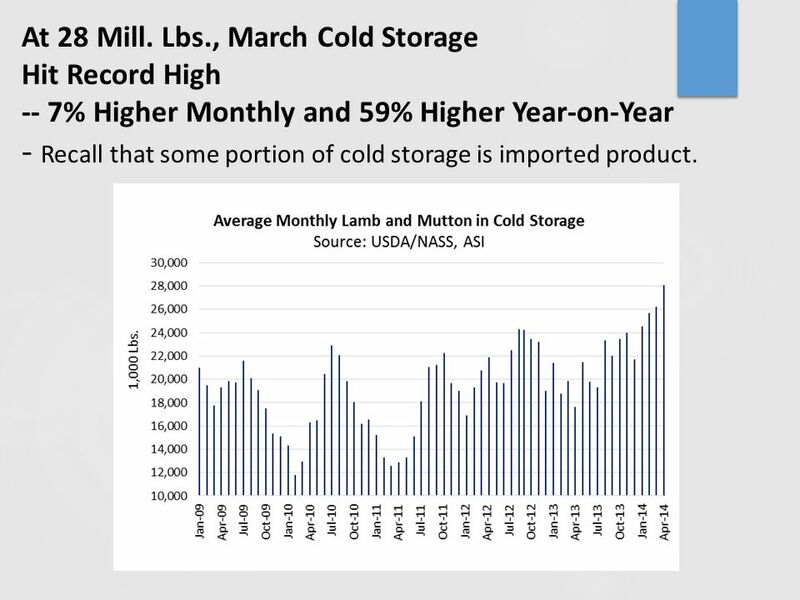 Lbs., March Cold Storage Hit Record High -- 7% Higher Monthly and 59% Higher Year-on-Year - Recall that some portion of cold storage is imported product. 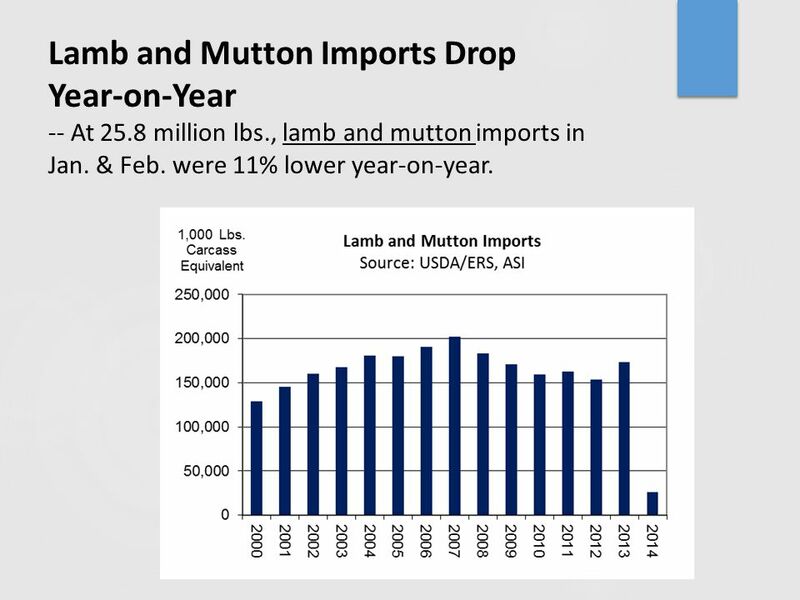 63 Lamb and Mutton Imports Drop Year-on-Year -- At 25.8 million lbs., lamb and mutton imports in Jan. & Feb. were 11% lower year-on-year. 69 Total Live Sheep Exports Up 18% in Jan. & Feb. Year-on-Year  U.S. live sheep exports to Mexico were 7,151 head in Jan. & Feb., up 258% year-on-year. 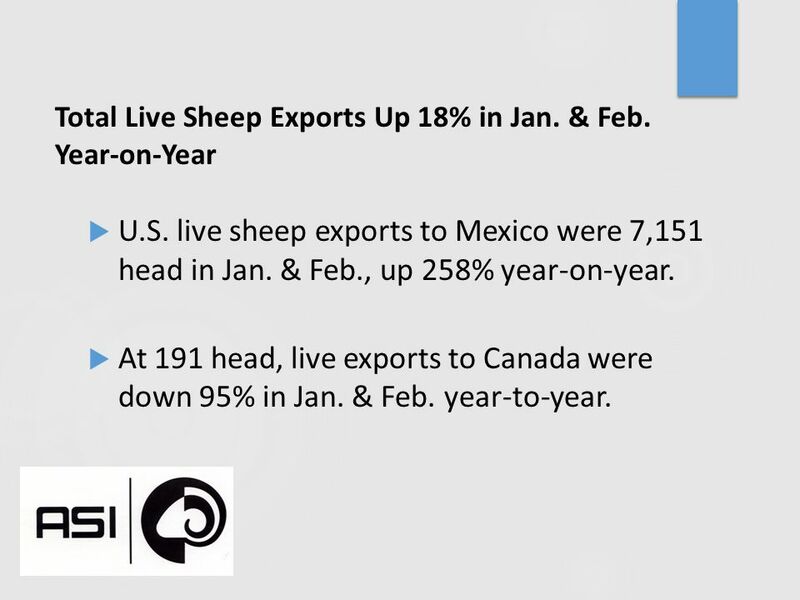  At 191 head, live exports to Canada were down 95% in Jan. & Feb. year-to-year. 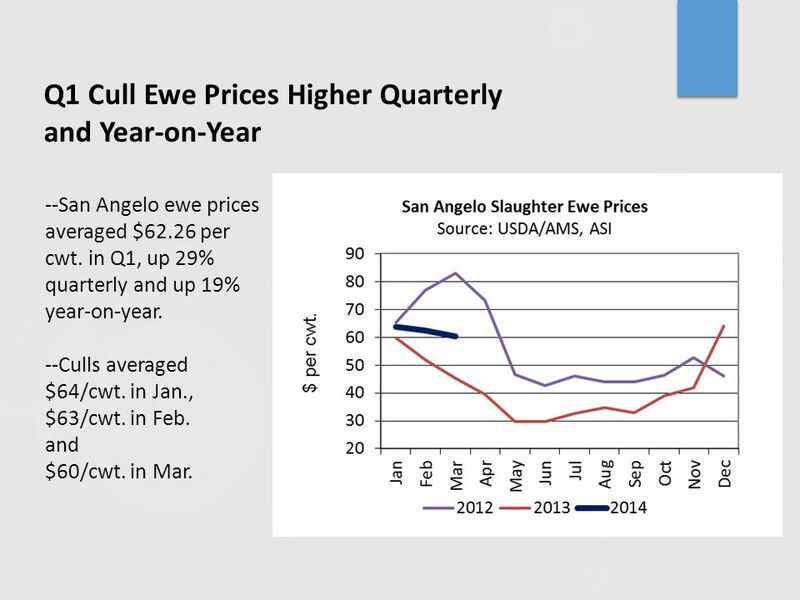 70 Q1 Cull Ewe Prices Higher Quarterly and Year-on-Year --San Angelo ewe prices averaged $62.26 per cwt. in Q1, up 29% quarterly and up 19% year-on-year. --Culls averaged $64/cwt. in Jan., $63/cwt. in Feb. and $60/cwt. in Mar. 71 XIII. Nontraditional Market Andrew, 2006. 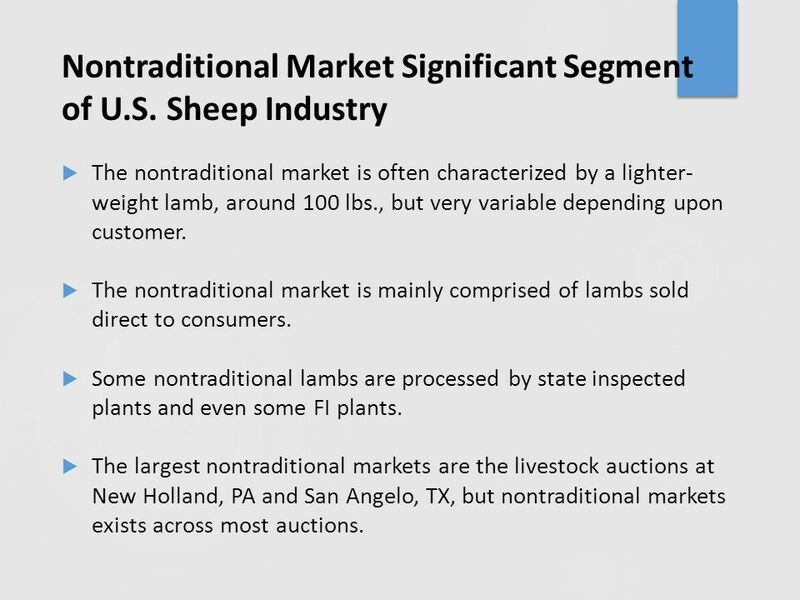 72 Nontraditional Market Significant Segment of U.S. Sheep Industry  The nontraditional market is often characterized by a lighter- weight lamb, around 100 lbs., but very variable depending upon customer. 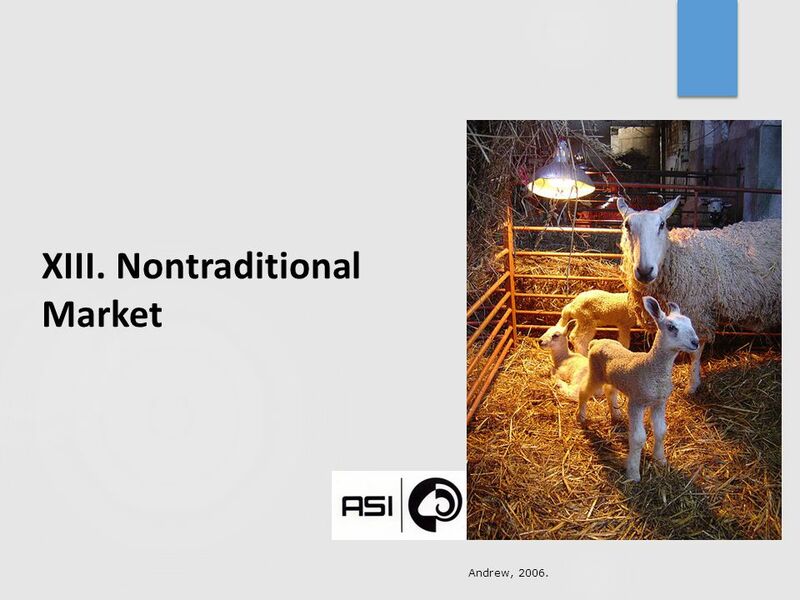  The nontraditional market is mainly comprised of lambs sold direct to consumers. 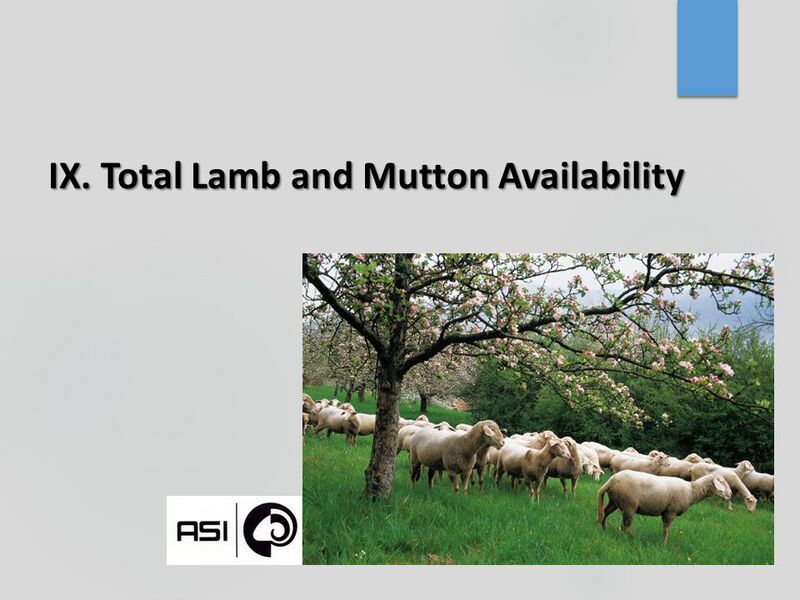  Some nontraditional lambs are processed by state inspected plants and even some FI plants. 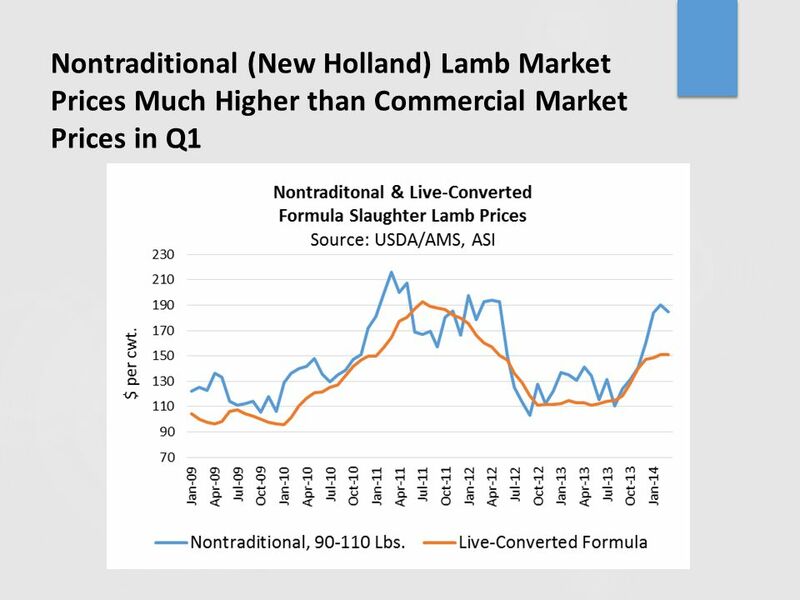  The largest nontraditional markets are the livestock auctions at New Holland, PA and San Angelo, TX, but nontraditional markets exists across most auctions. 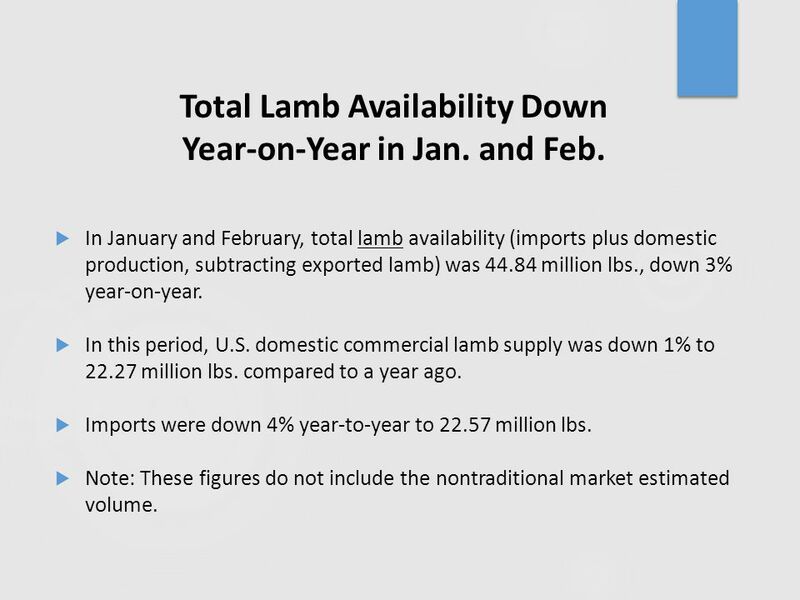 75  In January and February, total lamb availability (imports plus domestic production, subtracting exported lamb) was 44.84 million lbs., down 3% year-on-year. 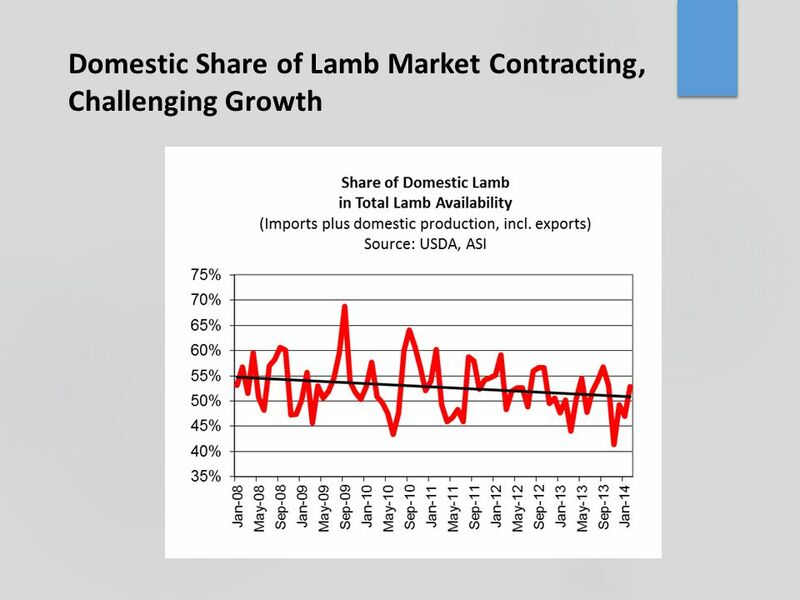  In this period, U.S. domestic commercial lamb supply was down 1% to 22.27 million lbs. compared to a year ago. 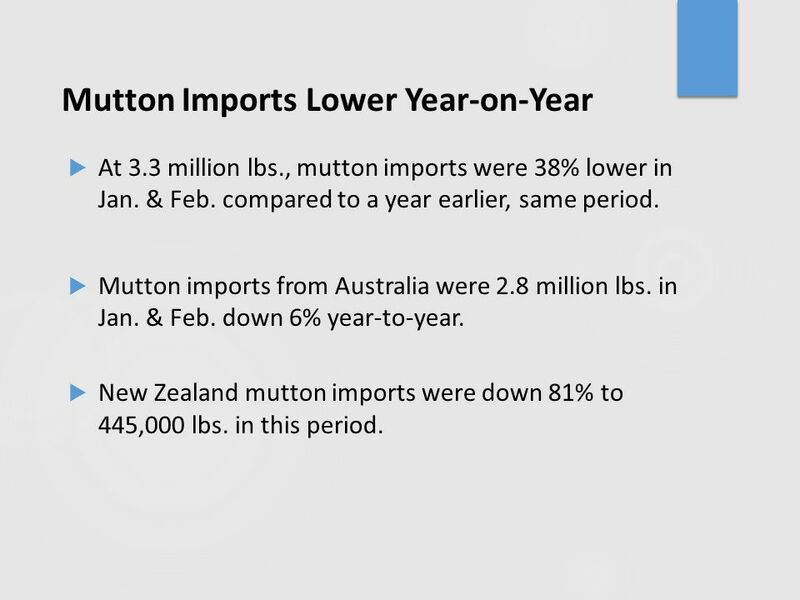  Imports were down 4% year-to-year to 22.57 million lbs.  Note: These figures do not include the nontraditional market estimated volume. 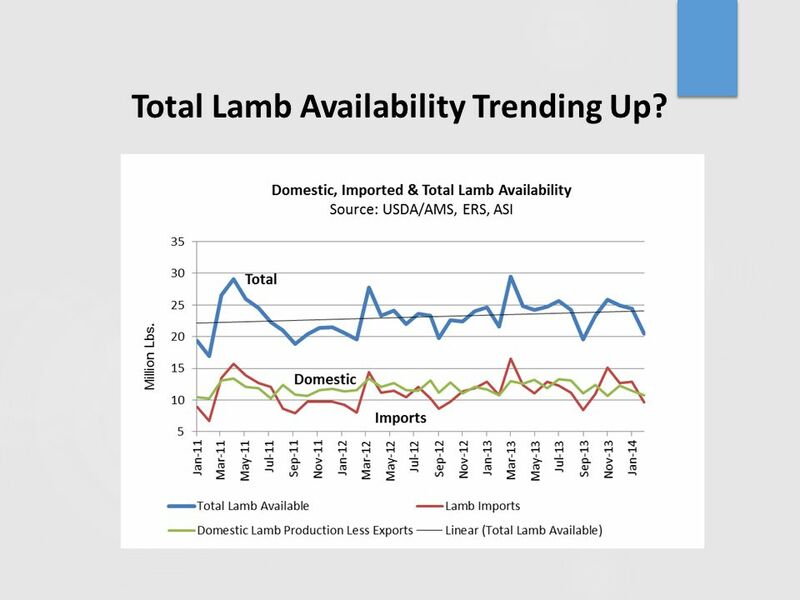 Total Lamb Availability Down Year-on-Year in Jan. and Feb.
76 Total Lamb Availability Trending Up? 77 U.S. 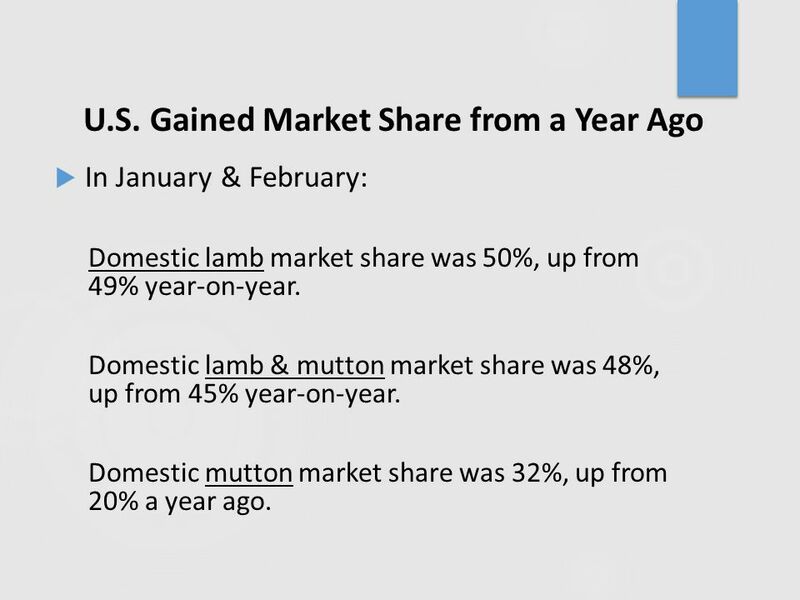 Gained Market Share from a Year Ago  In January & February: Domestic lamb market share was 50%, up from 49% year-on-year. 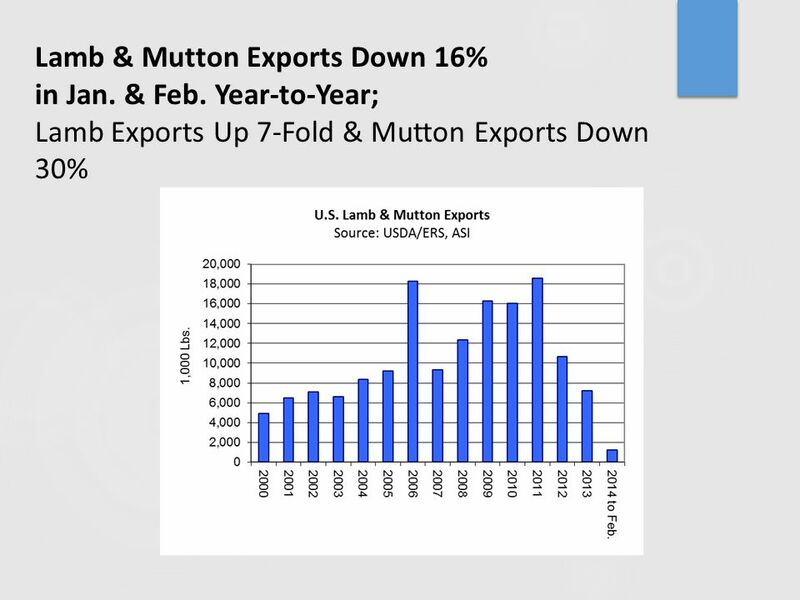 Domestic lamb & mutton market share was 48%, up from 45% year-on-year. 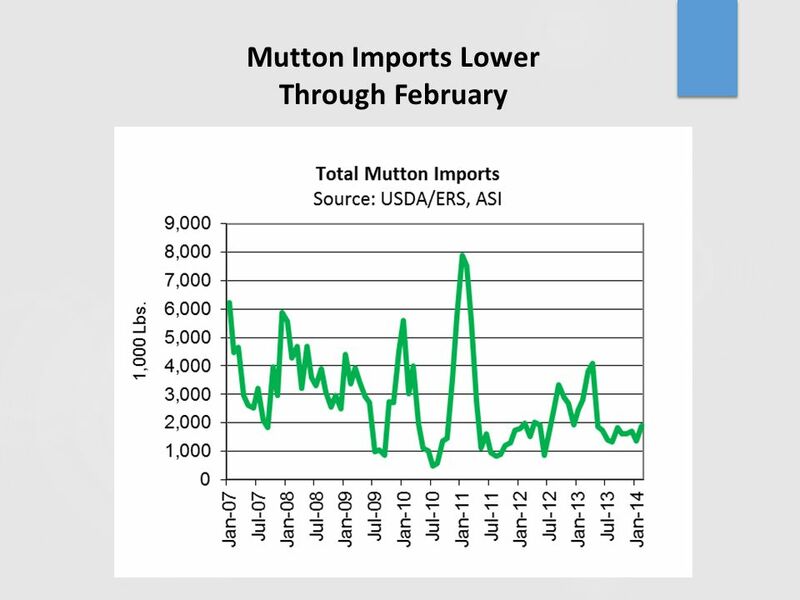 Domestic mutton market share was 32%, up from 20% a year ago. 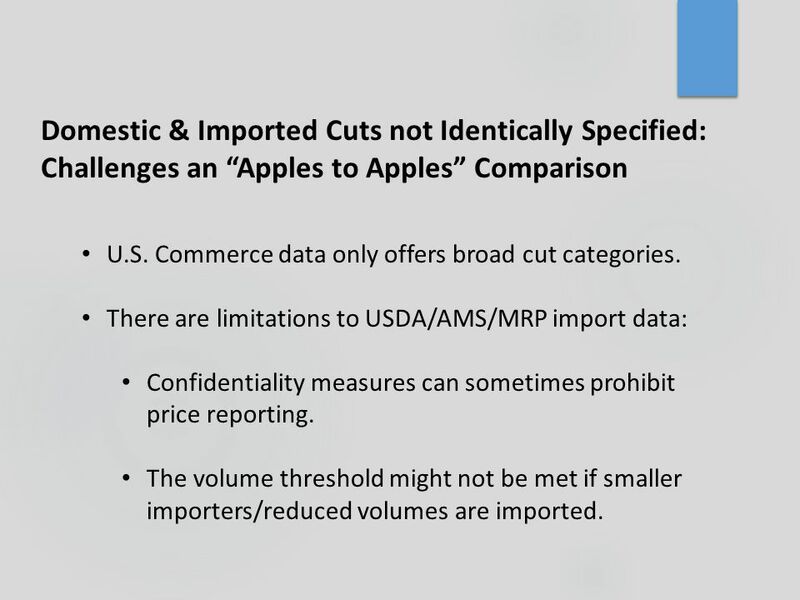 80 Domestic & Imported Cuts not Identically Specified: Challenges an “Apples to Apples” Comparison U.S. Commerce data only offers broad cut categories. 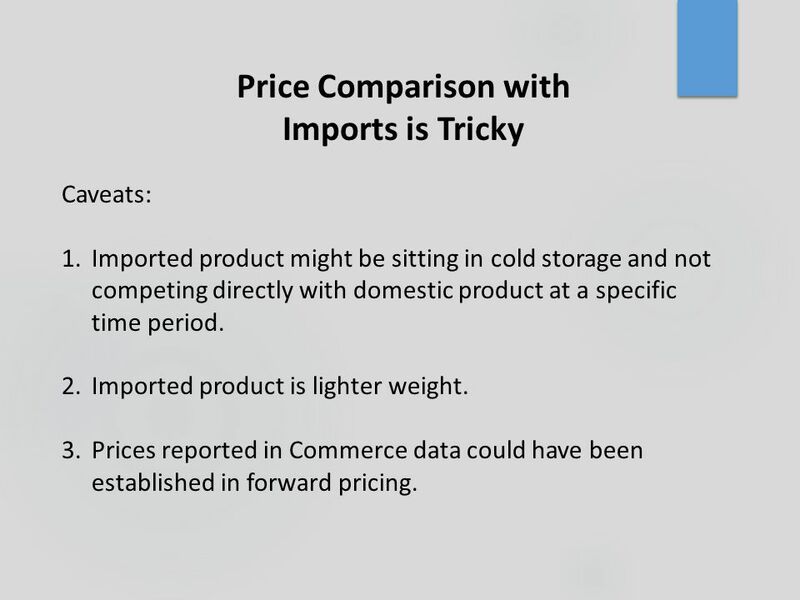 There are limitations to USDA/AMS/MRP import data: Confidentiality measures can sometimes prohibit price reporting. The volume threshold might not be met if smaller importers/reduced volumes are imported. 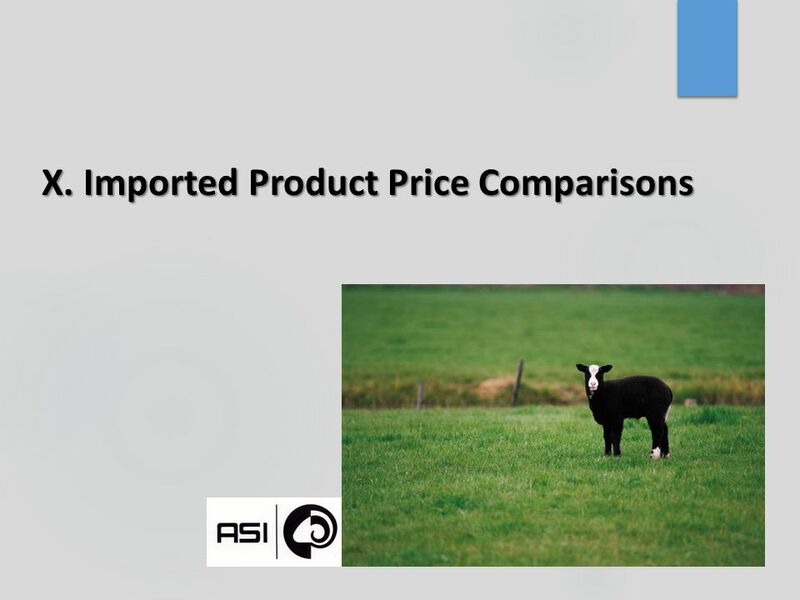 81 Price Comparison with Imports is Tricky Caveats: 1.Imported product might be sitting in cold storage and not competing directly with domestic product at a specific time period. 2.Imported product is lighter weight. 3.Prices reported in Commerce data could have been established in forward pricing. 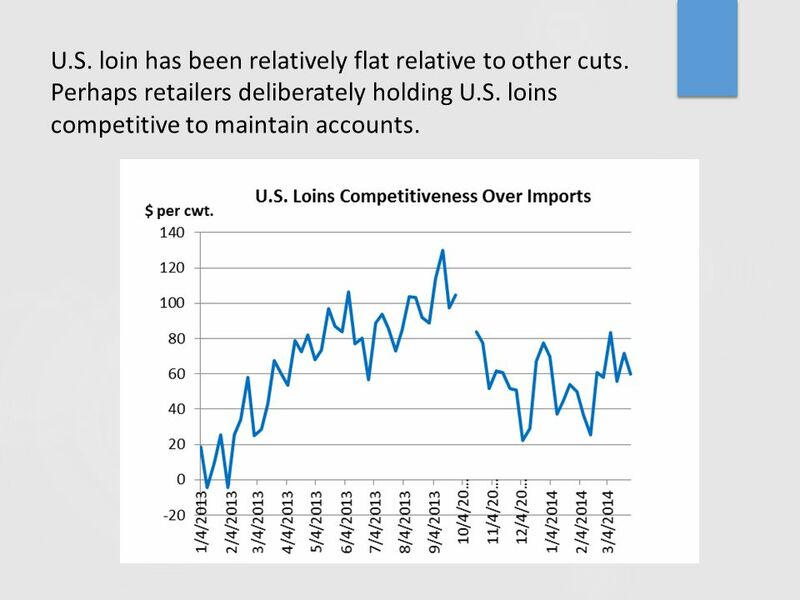 83 U.S. loin has been relatively flat relative to other cuts. Perhaps retailers deliberately holding U.S. loins competitive to maintain accounts. 84 U.S. 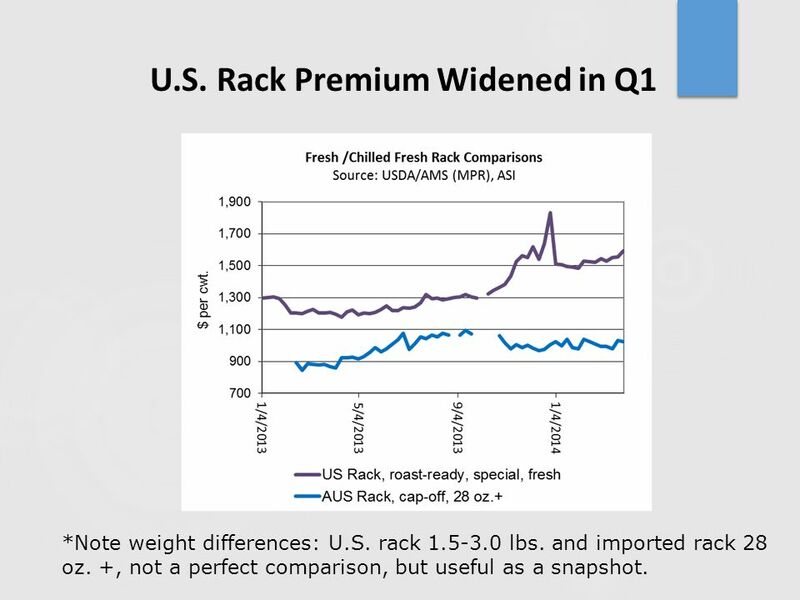 Rack Premium Widened in Q1 *Note weight differences: U.S. rack 1.5-3.0 lbs. and imported rack 28 oz. +, not a perfect comparison, but useful as a snapshot. 85 The Competitiveness of the U.S. 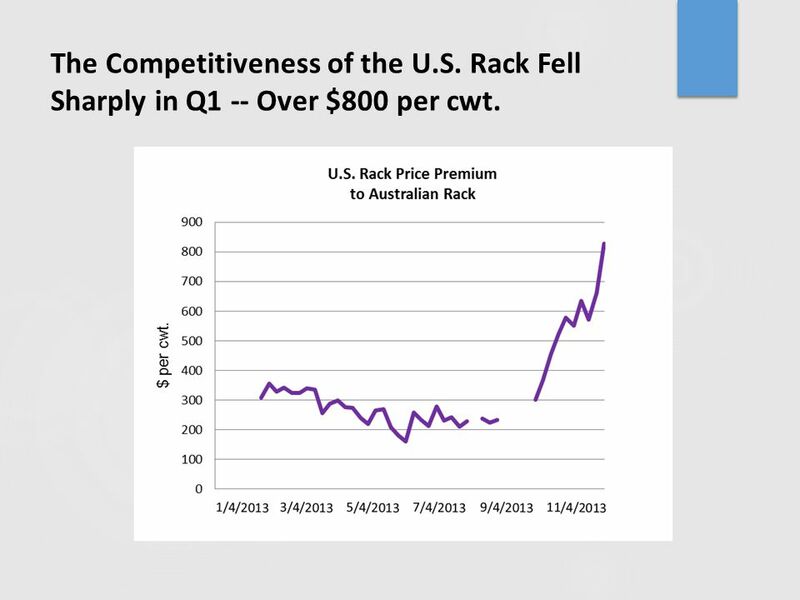 Rack Fell Sharply in Q1 -- Over $800 per cwt. 86 U.S. 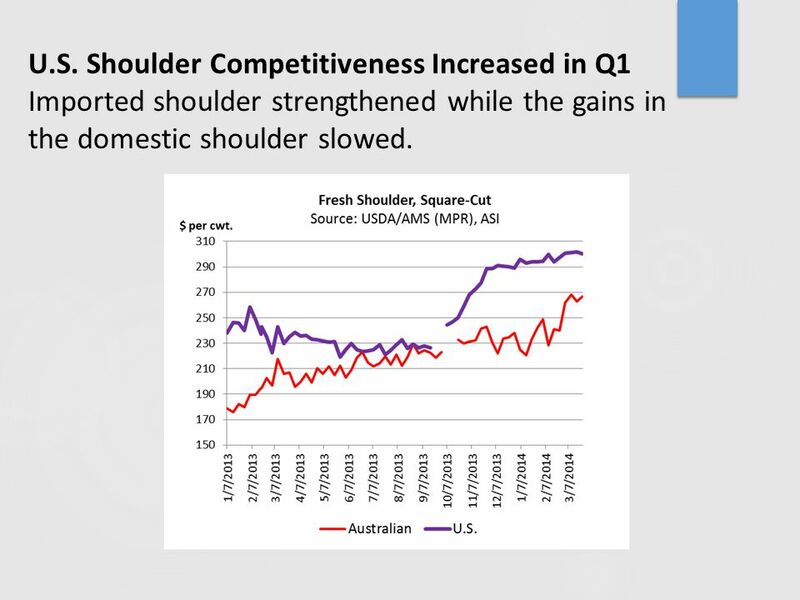 Shoulder Competitiveness Increased in Q1 Imported shoulder strengthened while the gains in the domestic shoulder slowed. 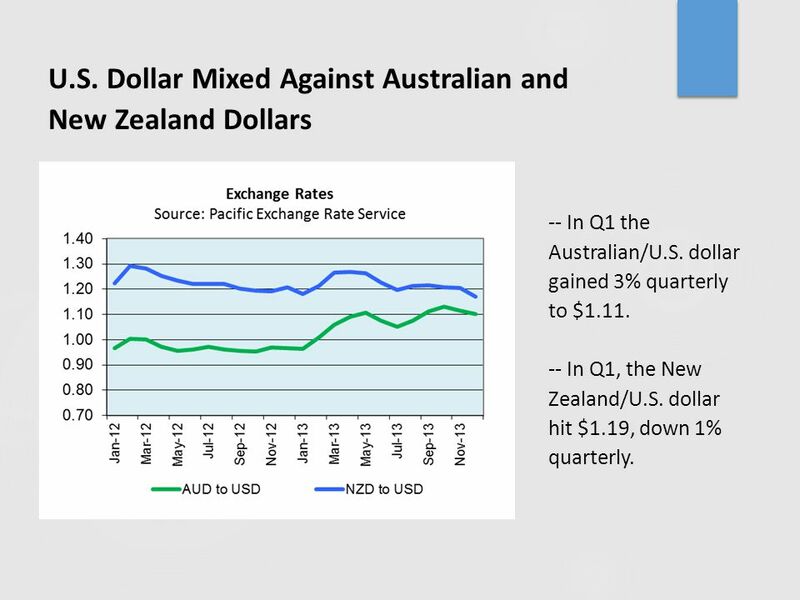 90 Year-over-year the U.S. dollar has appreciated against the Australian dollar (16%) In terms of U.S. exports, a higher exchange rate directly translates into higher costs for the buyer and usually a drop in tonnage sold. 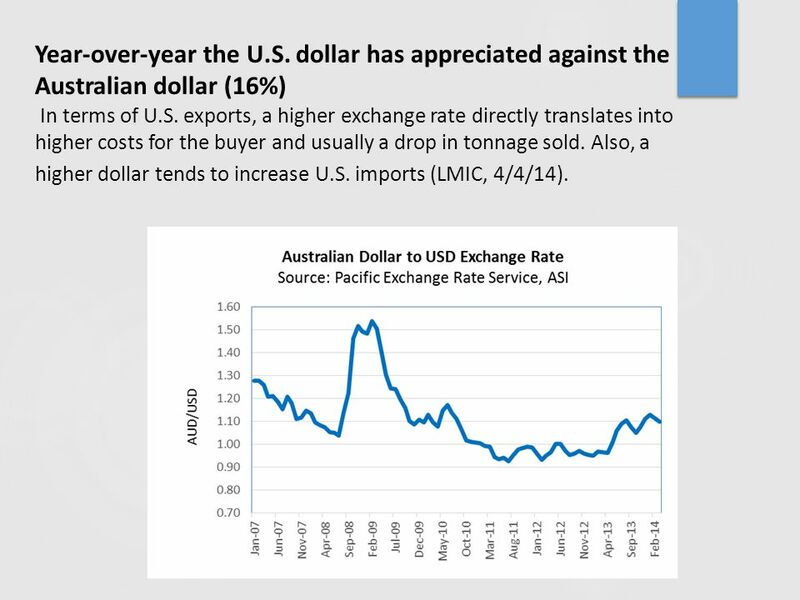 Also, a higher dollar tends to increase U.S. imports (LMIC, 4/4/14). 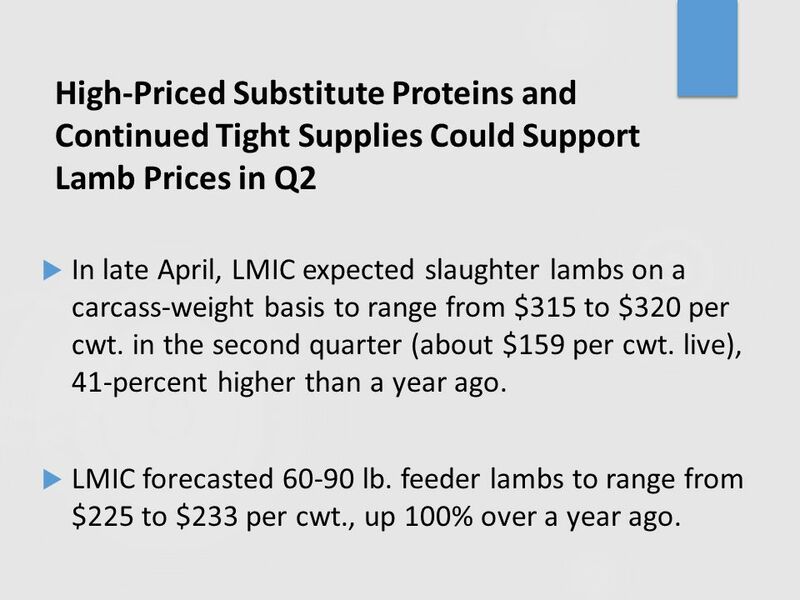 92 High-Priced Substitute Proteins and Continued Tight Supplies Could Support Lamb Prices in Q2  In late April, LMIC expected slaughter lambs on a carcass-weight basis to range from $315 to $320 per cwt. in the second quarter (about $159 per cwt. live), 41-percent higher than a year ago.  LMIC forecasted 60-90 lb. 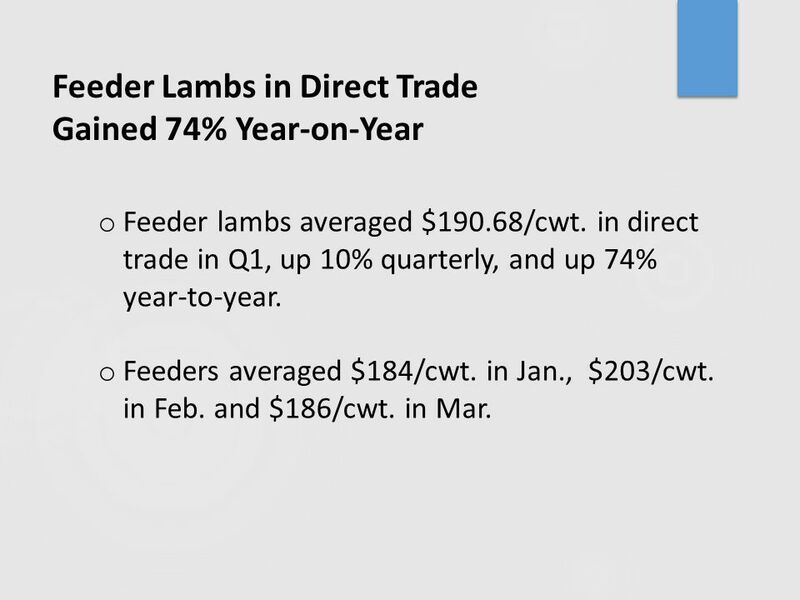 feeder lambs to range from $225 to $233 per cwt., up 100% over a year ago. 93 Seasonal Index Lends Predictive Insight  Price trends--up or down--depend on which factor dominates, supply or demand. 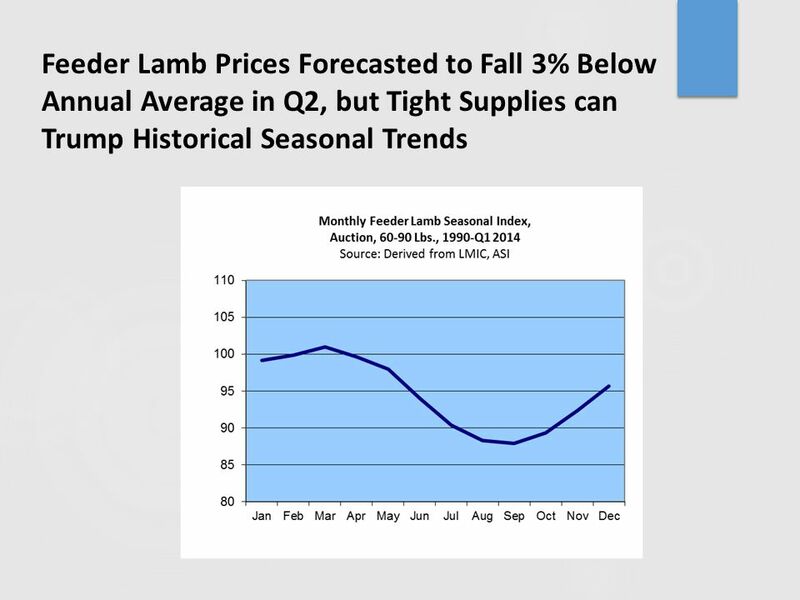  Feeder lamb prices typically fall through the second quarter when supply high and feeders moving into feedlots.  Slaughter lamb prices typically rise through the second quarter when supplies are seasonally tight and feeders not yet ready for market.  The index shows the average relationship of prices in each month to the average for the year. An index of 105 means prices are 5% above the annual price average. 96 Feeder Cost of Gain Might Increase Marginally in Q2 if Corn Prices Rise  Unexpectedly strong corn export demand raised the season-average corn price forecast in April by 10 cents to $4.40 to $4.80 per bu. in its 2013/14 marketing year (USDA/ERS).  Yet, “prospects for markedly higher U.S. corn prices through spring-summer 2014 are still somewhat limited by the presence of larger U.S. and World corn supplies in grower’s ownership that remain to be moved on to the market,” (KSU, 4/2013). 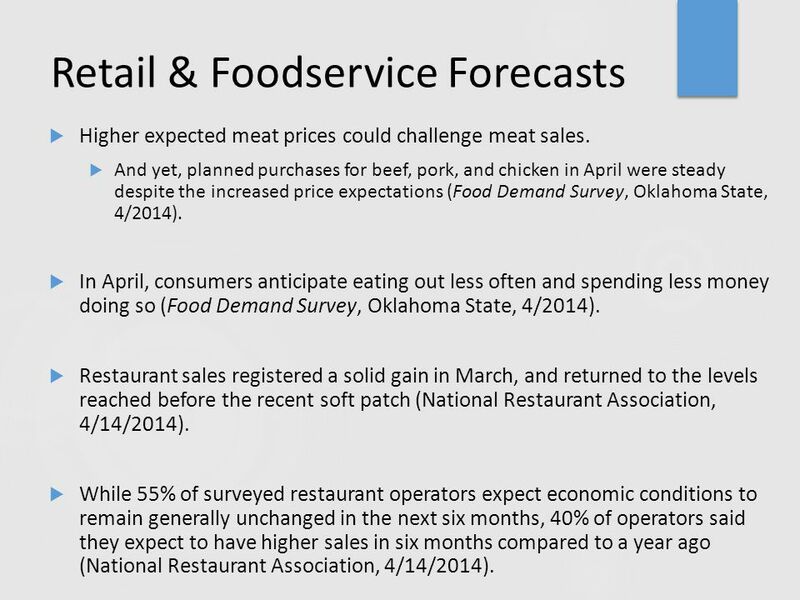 97 Retail & Foodservice Forecasts  Higher expected meat prices could challenge meat sales.  And yet, planned purchases for beef, pork, and chicken in April were steady despite the increased price expectations (Food Demand Survey, Oklahoma State, 4/2014).  In April, consumers anticipate eating out less often and spending less money doing so (Food Demand Survey, Oklahoma State, 4/2014).  Restaurant sales registered a solid gain in March, and returned to the levels reached before the recent soft patch (National Restaurant Association, 4/14/2014). 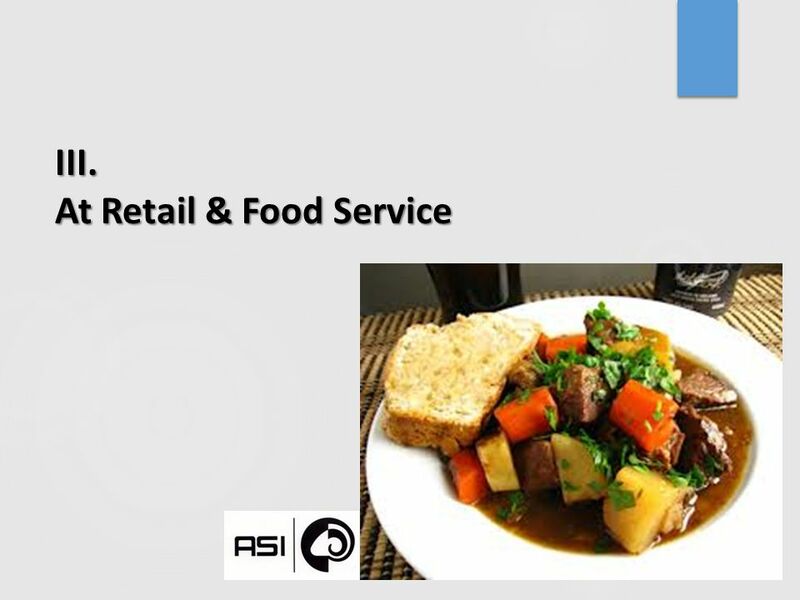  While 55% of surveyed restaurant operators expect economic conditions to remain generally unchanged in the next six months, 40% of operators said they expect to have higher sales in six months compared to a year ago (National Restaurant Association, 4/14/2014). 98 As meat prices rise, higher incomes will help maintain demand. 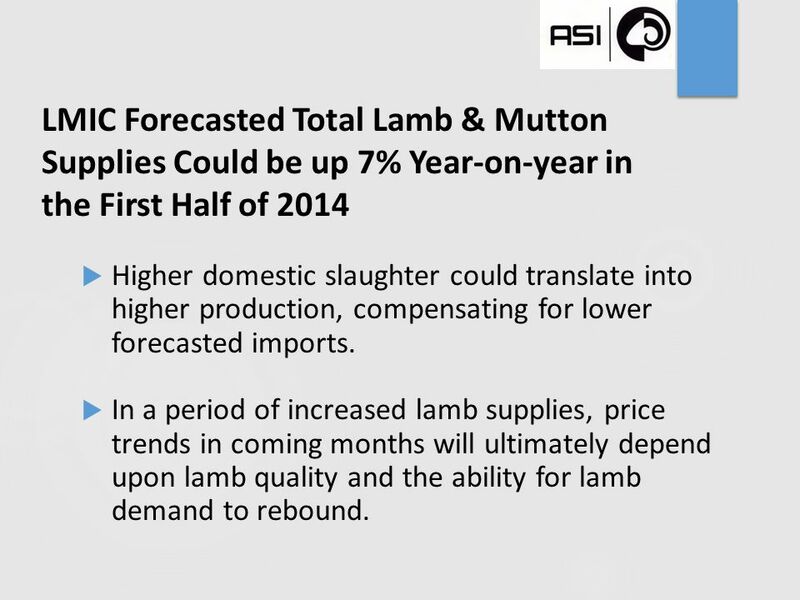 -- Income grew in Jan. & Feb. after falling 5% between last Sept. and Dec.
99 LMIC Forecasted Total Lamb & Mutton Supplies Could be up 7% Year-on-year in the First Half of 2014  Higher domestic slaughter could translate into higher production, compensating for lower forecasted imports. 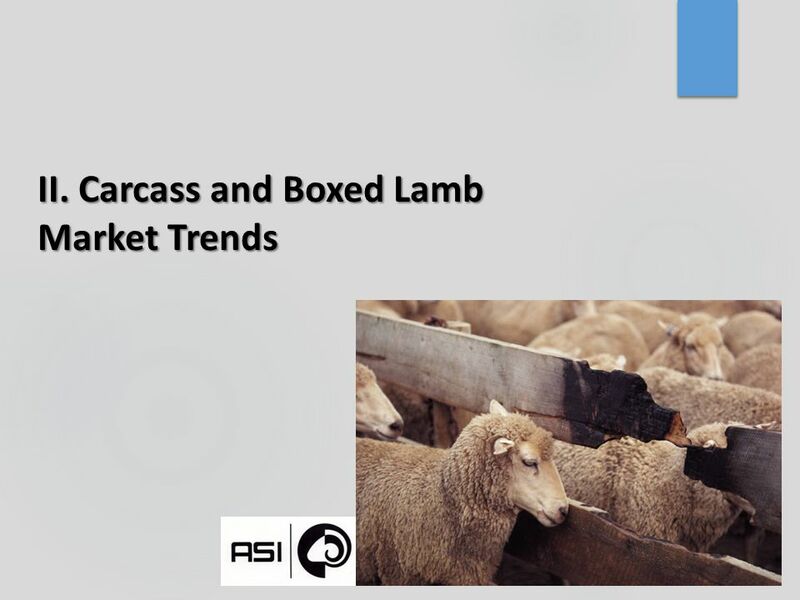  In a period of increased lamb supplies, price trends in coming months will ultimately depend upon lamb quality and the ability for lamb demand to rebound. 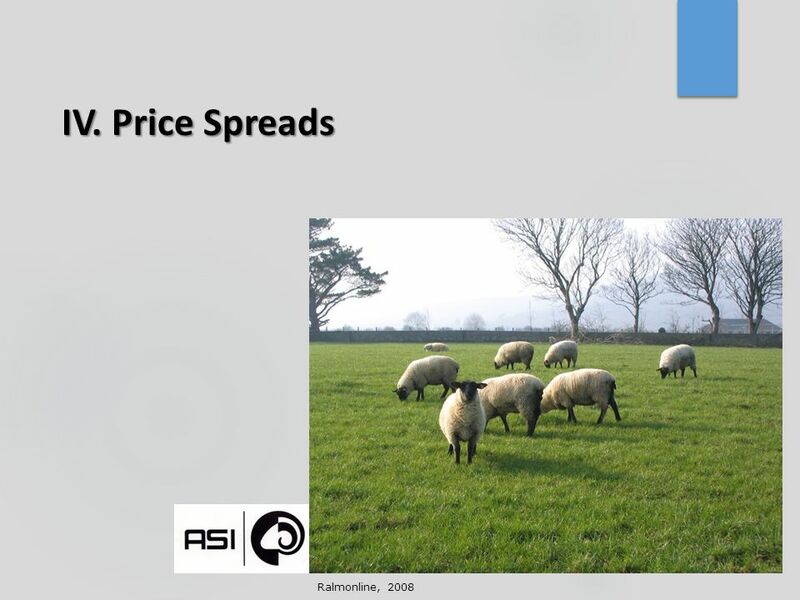 Download ppt "First-Quarter 2014 Sheep Industry Review Prepared by the American Sheep Industry Association for the American Lamb Board April 2014." 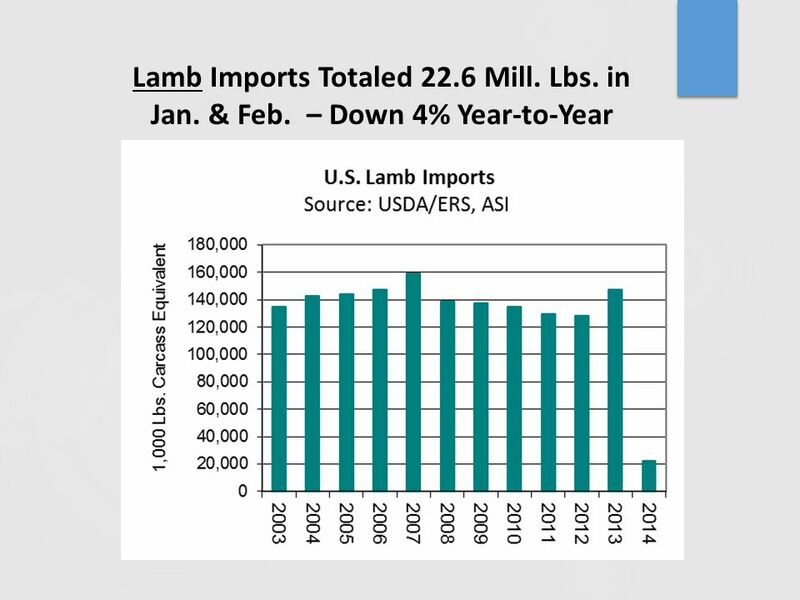 Last year was another record-breaking year for the lamb market. 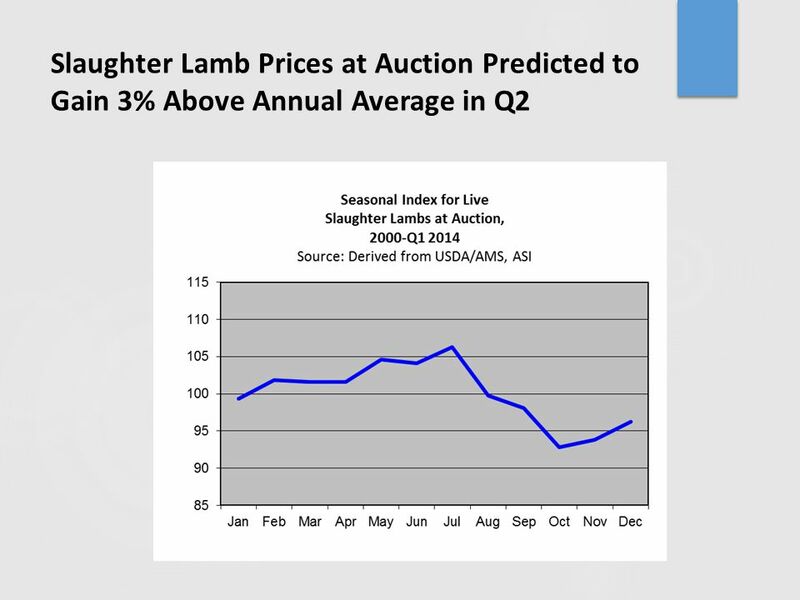 Significant price appreciation was seen across most lamb sectors for about 18 months. Prospects for U.S. Meat Exports The View From Washington Shayle Shagam World Agricultural Outlook Board U.S. Department of Agriculture. Second-Quarter 2013 Sheep Industry Review Prepared by American Sheep Industry Association for the American Lamb Board July 2013. 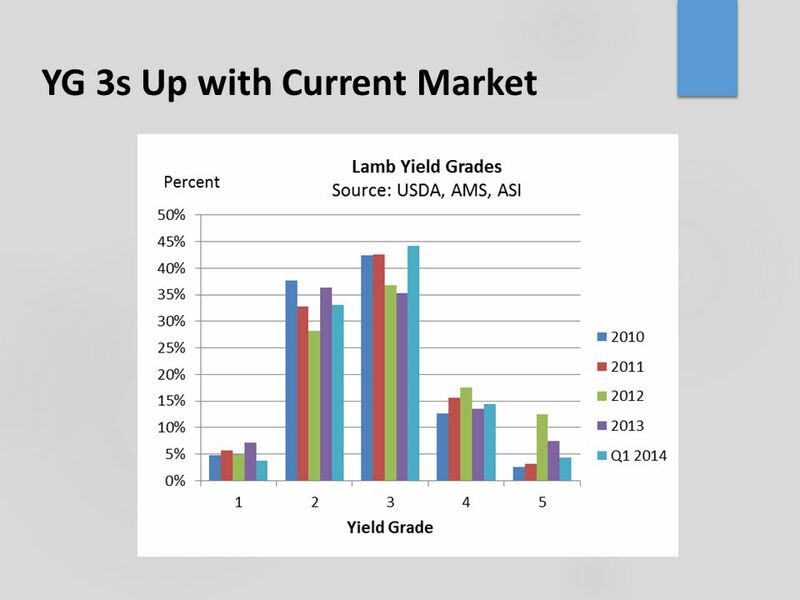 Third-Quarter 2014 Sheep Industry Review Prepared by the American Sheep Industry Association for the American Lamb Board November 2014. 2013 Annual Sheep Industry Review Prepared by the American Sheep Industry Association for the for the American Lamb Board March 2014. 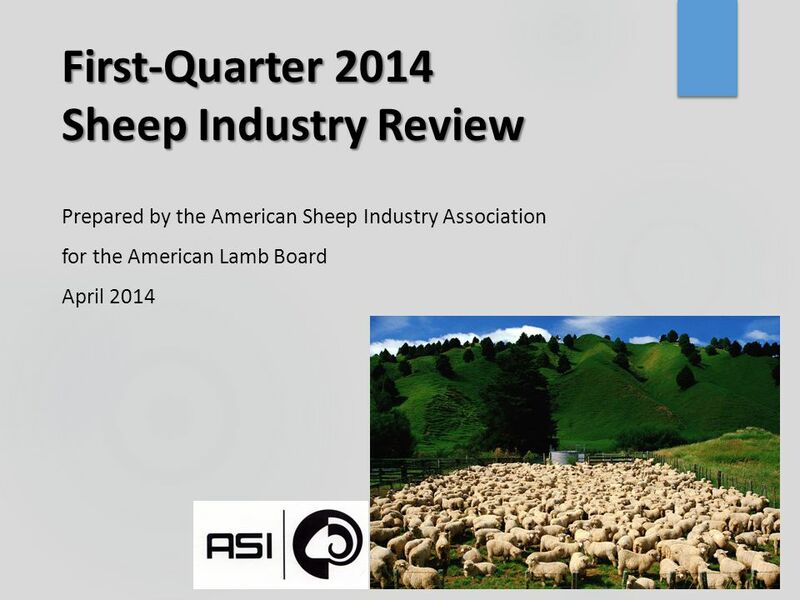 Third-Quarter 2013 Sheep Industry Review Prepared by American Sheep Industry Association for the American Lamb Board October 2013. 2015 Texas Economic Outlook: Tapping on the Brakes Keith Phillips Sr. Economist and Research Officer The views expressed in this presentation are strictly. Ron Plain D. Howard Doane Professor University of Missouri-Columbia Chicken & Competing Meats. 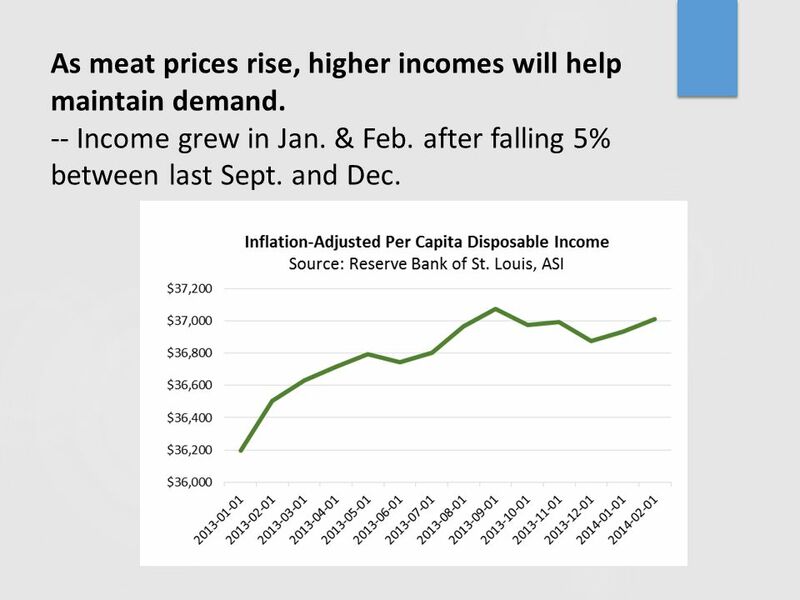 Red Meat and Poultry Outlook Curt Lacy Extension Economist-Livestock. Ron Plain Professor of Agricultural Economics University of Missouri-Columbia Swine Industry Outlook Worse than 1998? 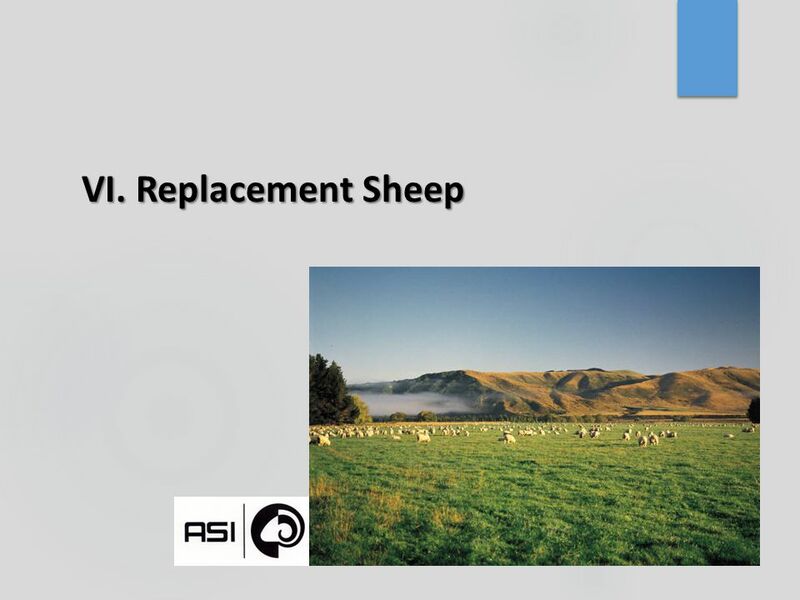 Fourth-Quarter 2013 Sheep Industry Review Prepared by the American Sheep Industry Association for the for the American Lamb Board January 2014. January 21, 2015 University of Missouri Extension.